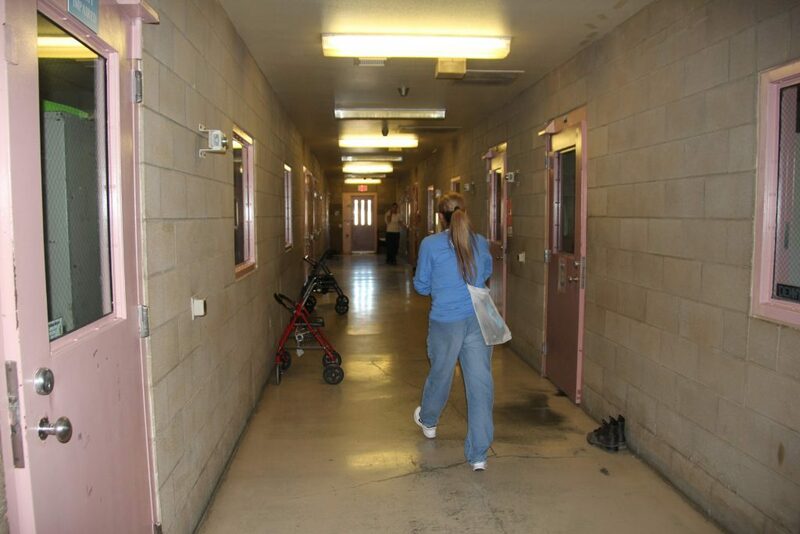 In June Dana and Josh headed to Avenal State Prison to officially start the program there. 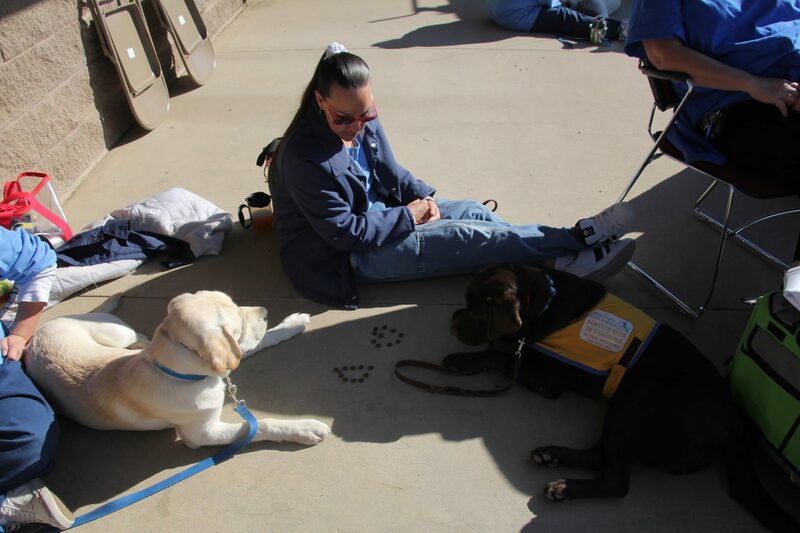 They brought Hunter, Mickey, Monte, Mia, and Mae to be the first pups to enter. 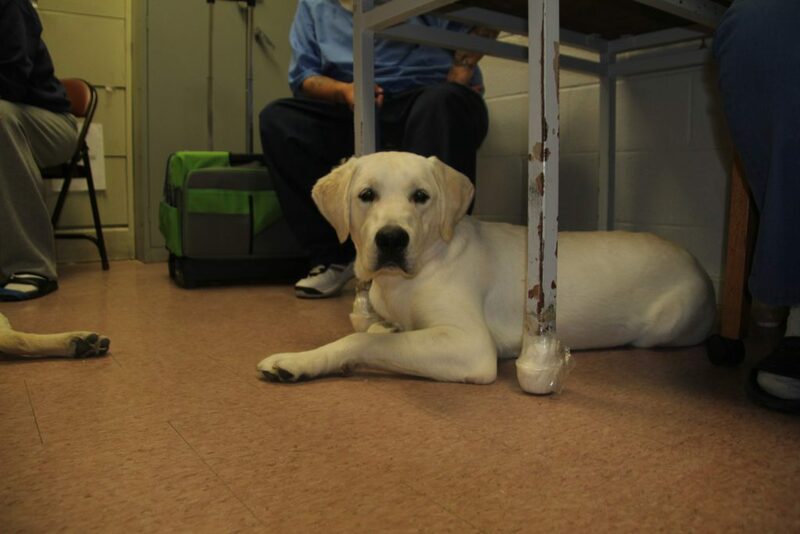 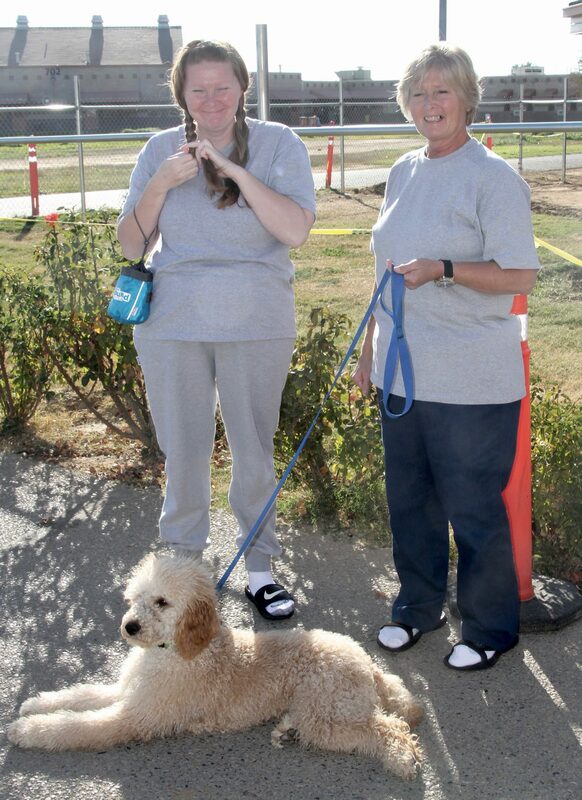 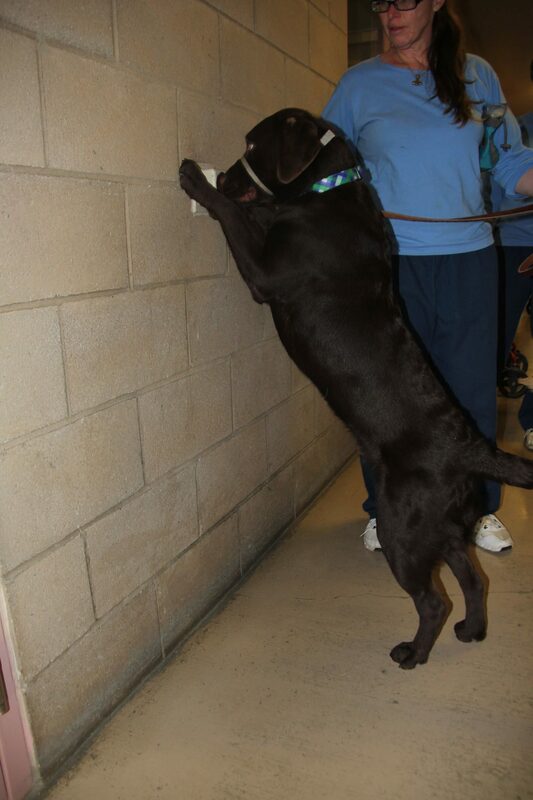 Each dog has two inmate-trainers and a few “rover” trainers are involved to cover and schedule conflicts as well. 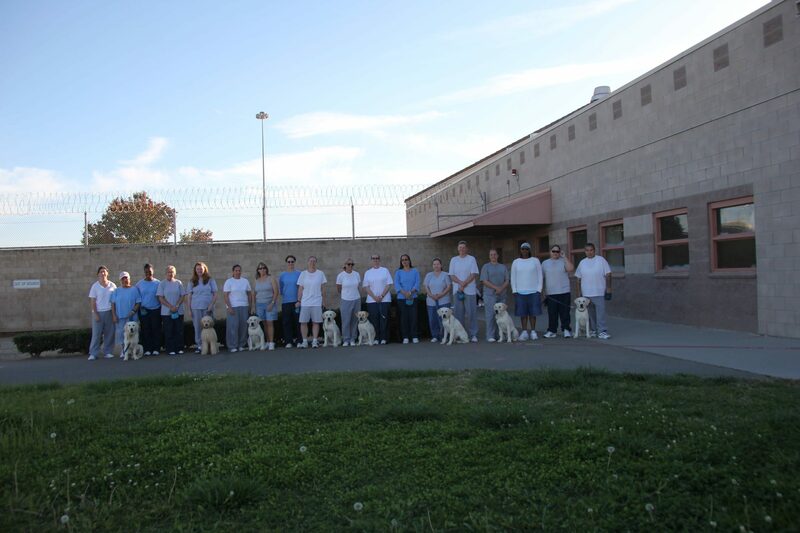 The men were very happy to work with the dogs and did an awesome job starting in with the training. 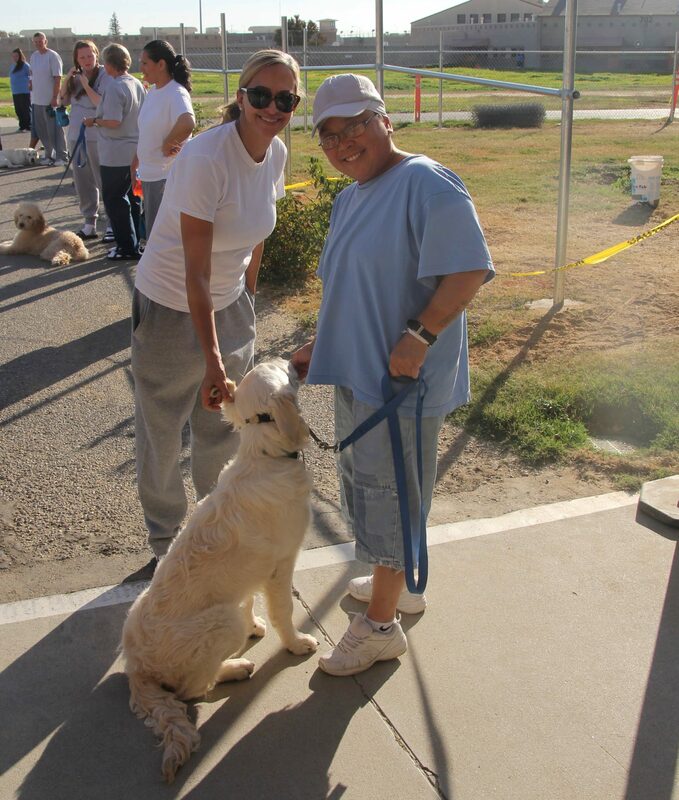 They were very attentive to Josh and Dana, and were quick to take initiative for the dogs’ benefit. 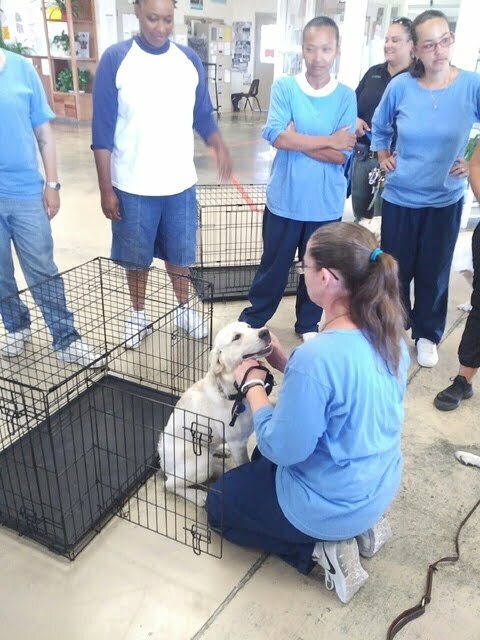 It was a very successful first week, with Josh and Dana leaving confident that the men will do a great job training the dog. 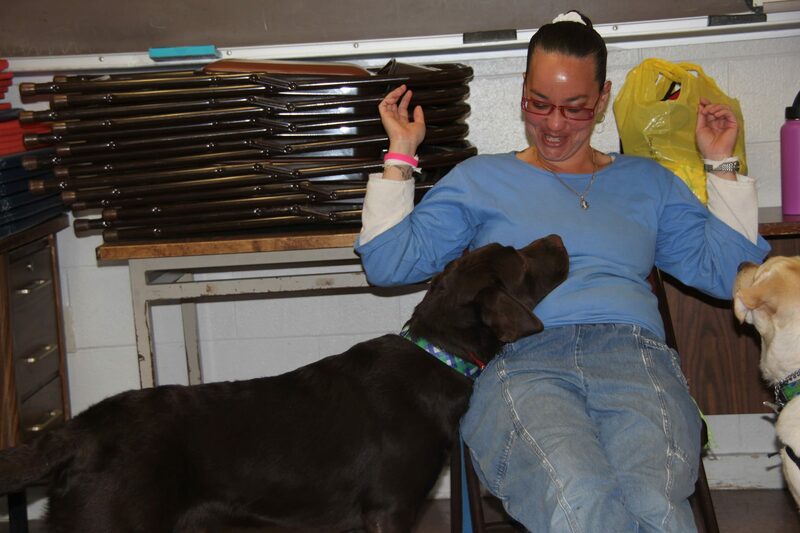 Josh and Dana are set to return in about six weeks, and expect to see a lot of progress with each dogs. 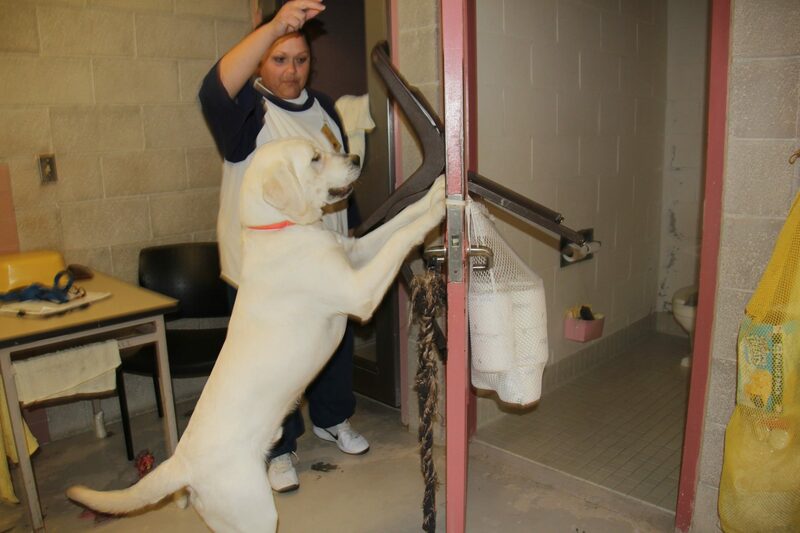 The dogs took the inmates quickly, and their personalities really started to come out. 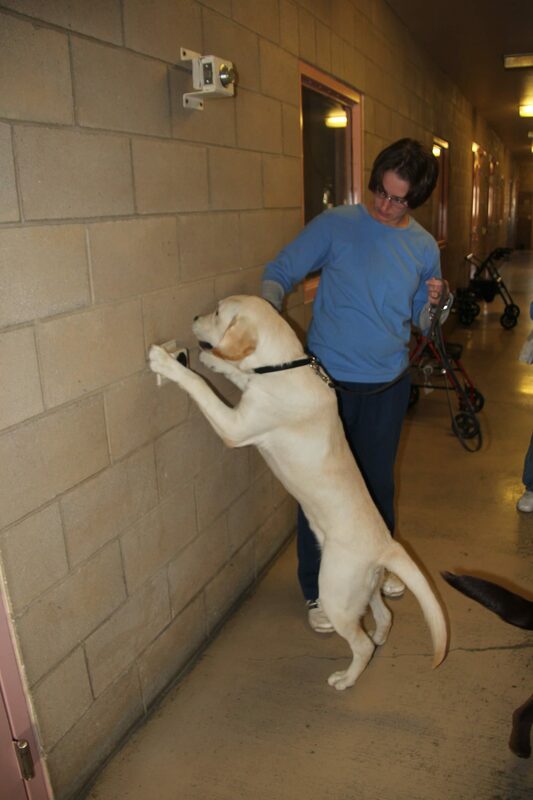 We are very excited for Josh and Dana to get back up there for a progress update. The men learned so quickly in the prison that Josh and Dana even had time for a surprise visit at CCWF. 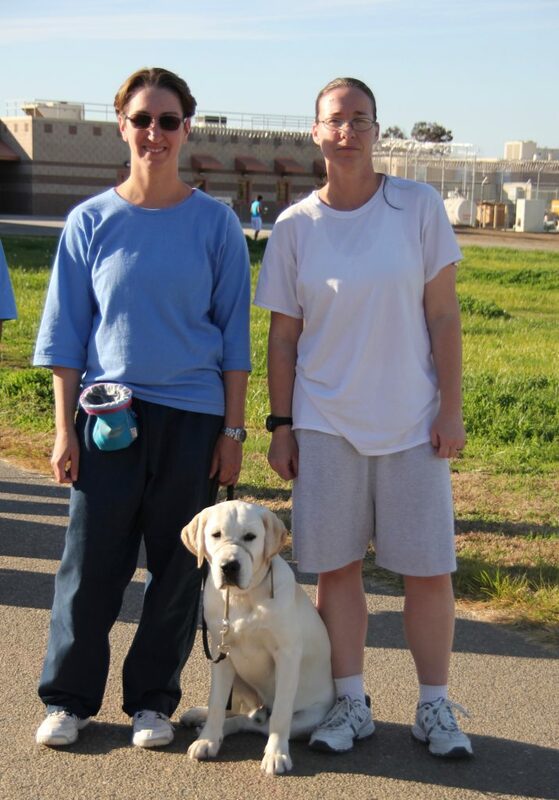 Although it was only a day, they were able to accomplish a lot and help with furthering the advanced training for the J-Litter. 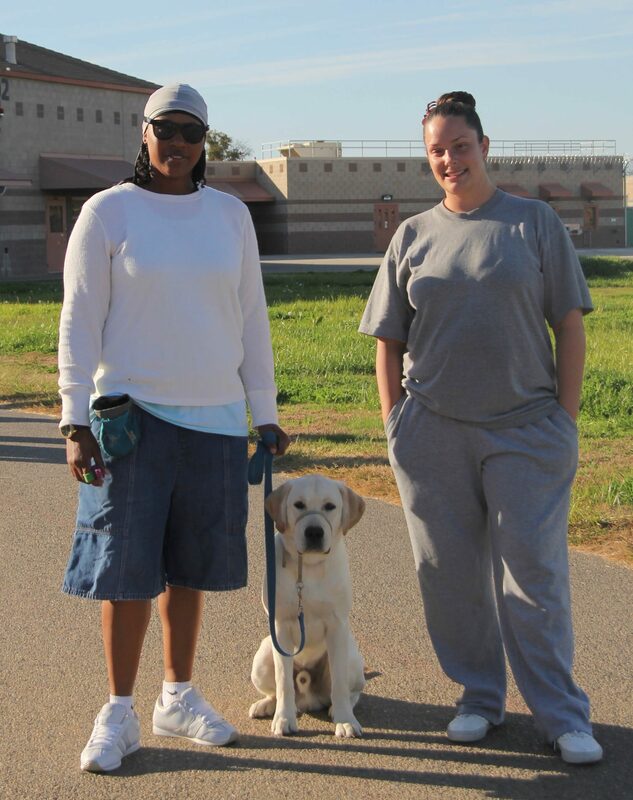 This trip saw a joint effort between Dana, Katie and Josh for a week at CCWF. 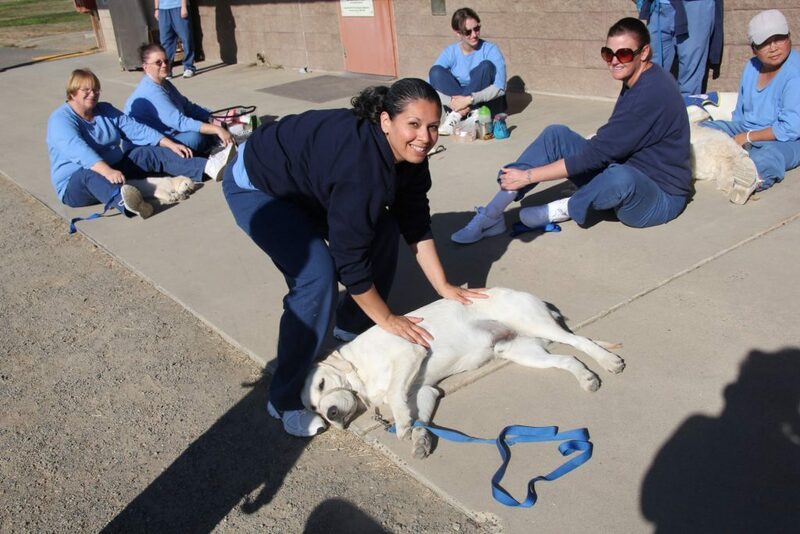 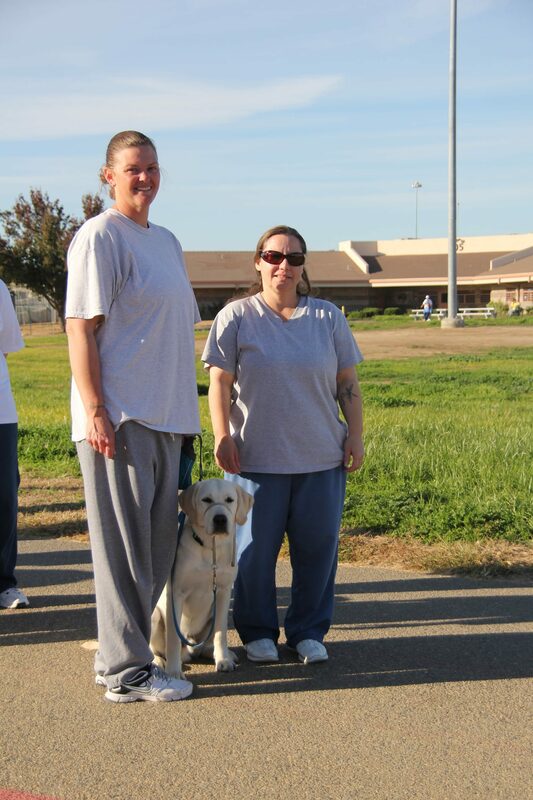 Dana introduced Josh to the inmate trainers and had a successful week working the dogs. 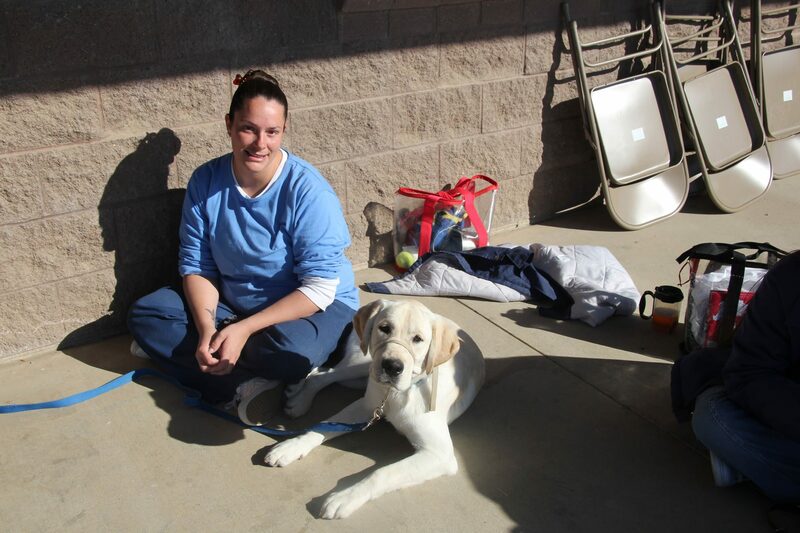 Between Dana and Josh, the two were able to accomplish a lot with both the dogs and trainers. 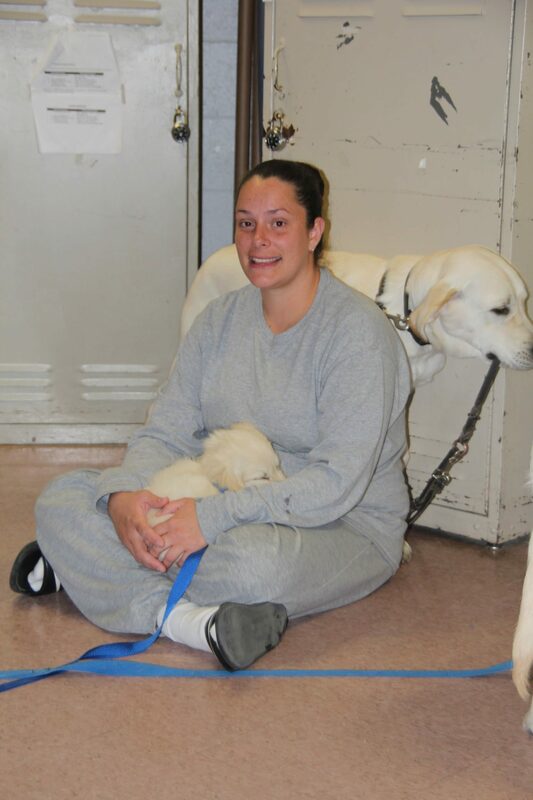 Each day that Dana and Josh were working in the prison, Katie had two dogs in her hotel room getting socialized with her children. 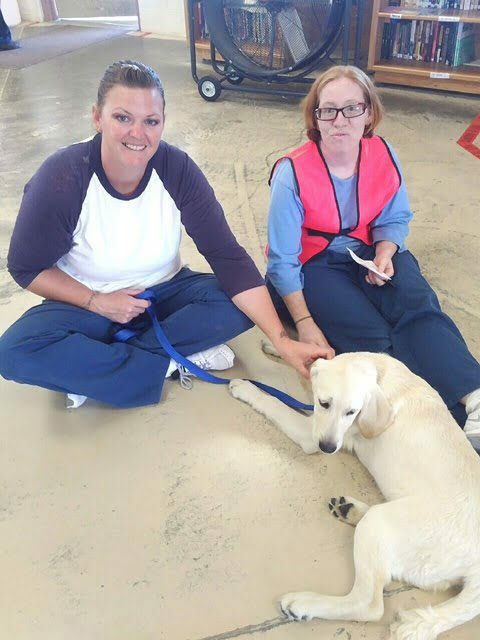 It was a very positive trip in the sense that Katie, Dana, and Josh were able to see exactly where the dogs needed improvement in terms of socialization. Having Josh worked well because it allowed Dana to have more one-on-one time with each inmate-trainer while Josh got to work with each dog to give them experience with a male handler. Seeing the needs for greater socialization, many items were brought in to work the dogs around, like skateboards, hula hoops, kiddy pools, etc. 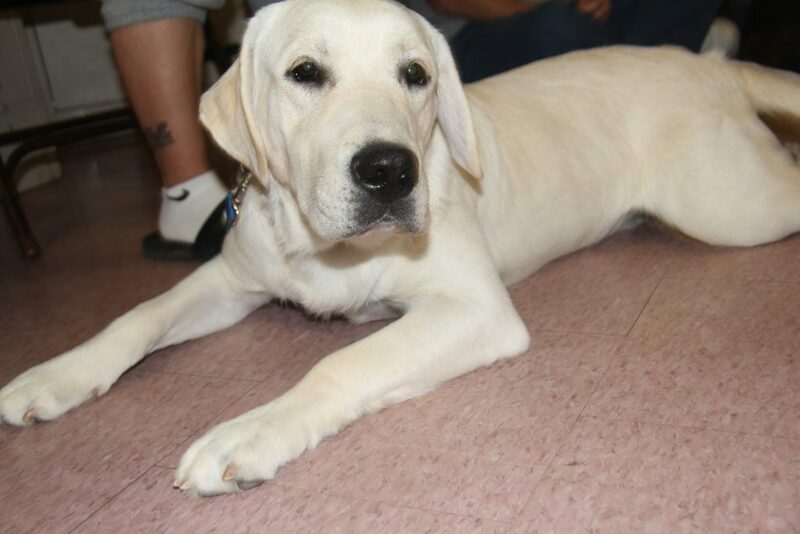 They also started to get a program in the works to have the dogs sent with fosters on the weekends so they can be socialized in public situations as well. 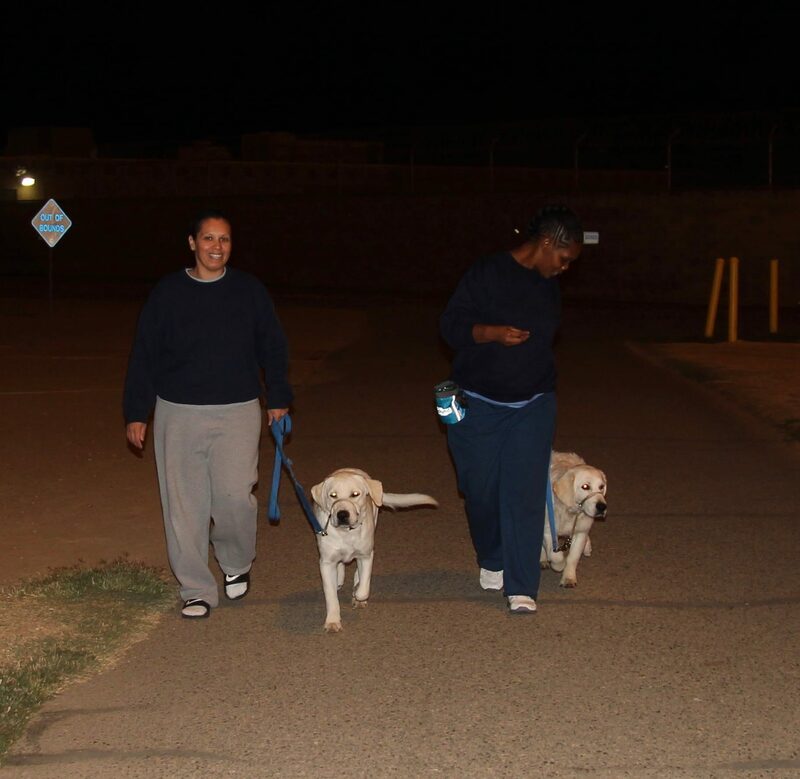 The training with the J-Litter was going well, and Dana, Josh and Katie were able to give directions to further progress the dogs. A tentative date for the J-Litter Graduation was set for sometime in October. 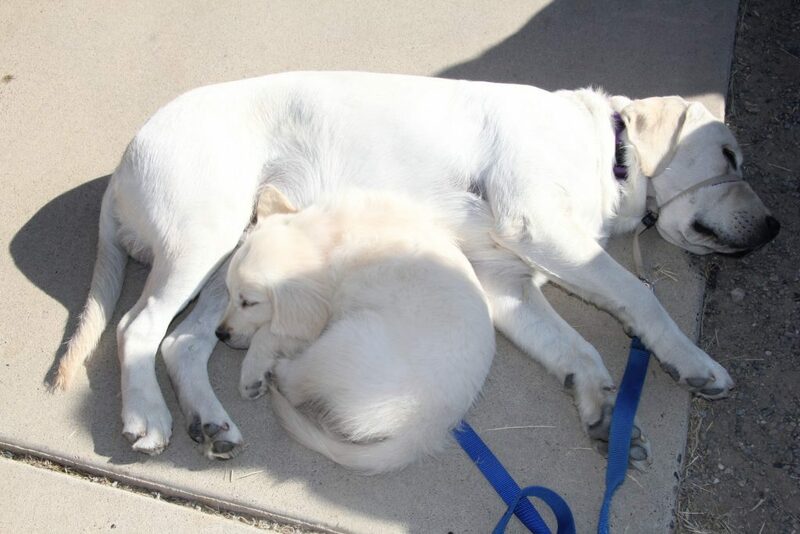 Little Angels was very happy with the trip, and is excited to see how the dogs learn from here. 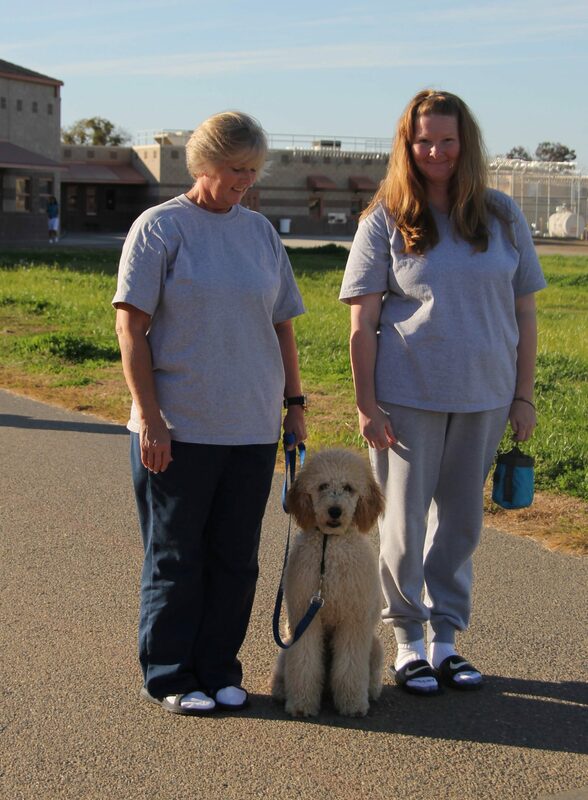 We recently had staff visiting the facility at CCWF in November and things are going extremely well! 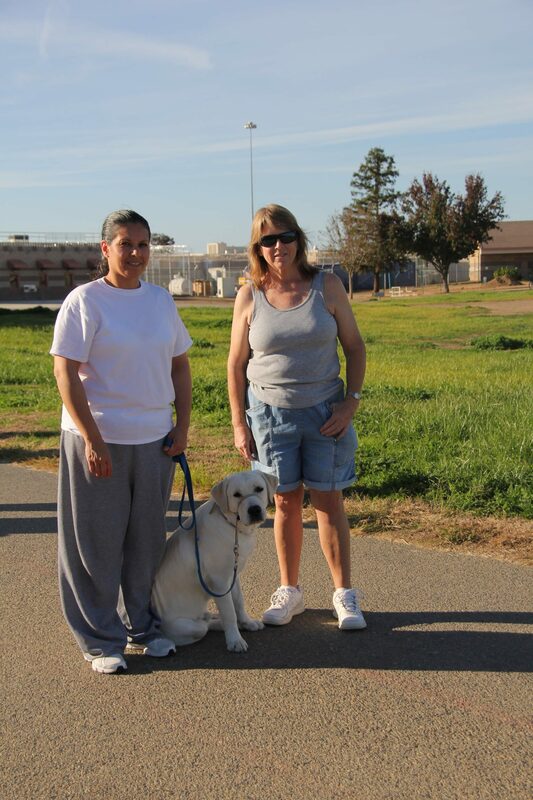 Both the inmate trainers and dogs are learning quickly and surpassing all goals set for them. 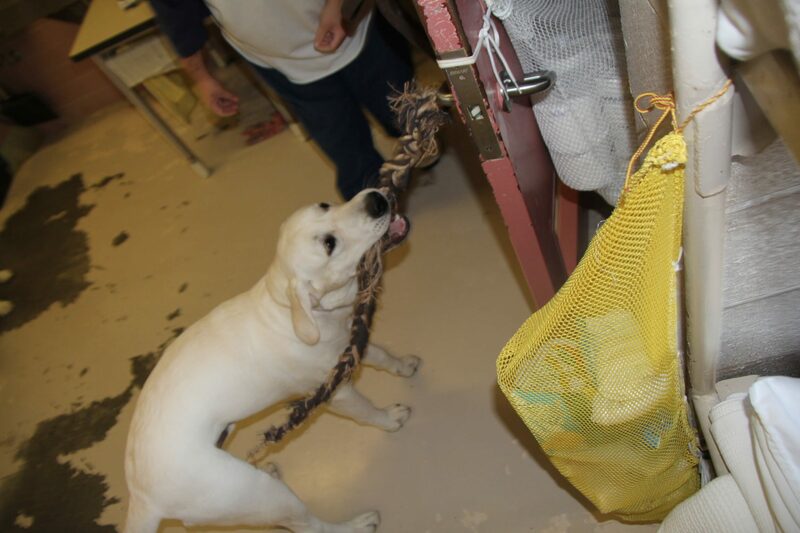 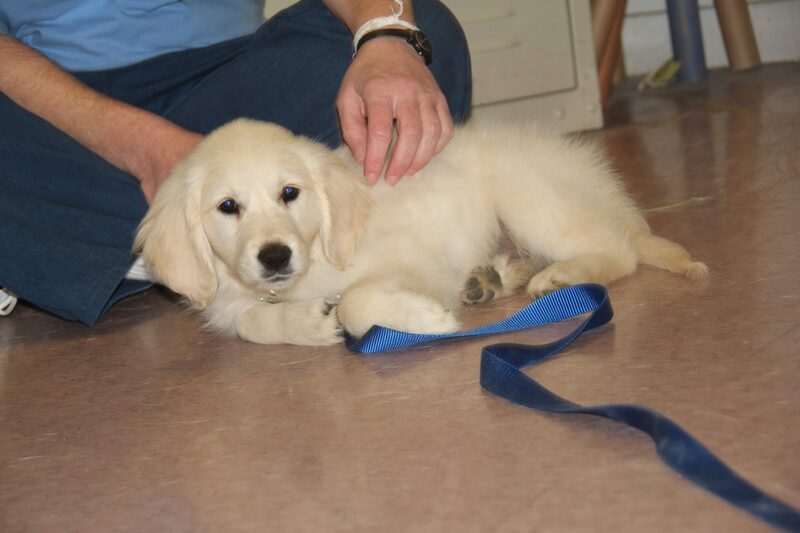 During this visit we brought our new J-Litter puppies to start training at the prison. 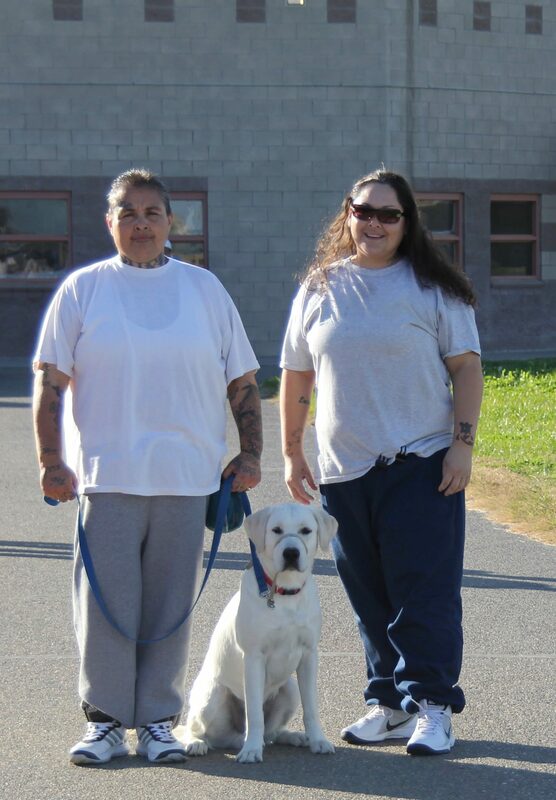 Our trainers from the first drop off in August quickly took on a mentor role and are helping new inmates get into the program. 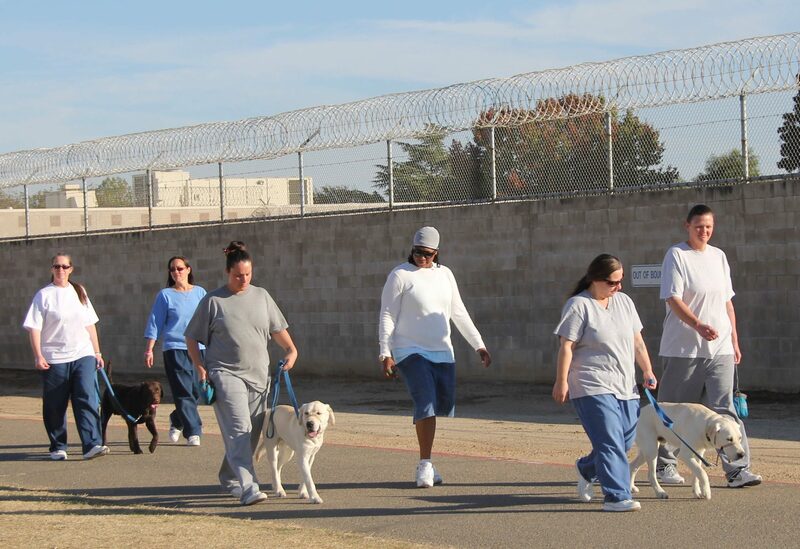 We are growing rapidly within the prison and have expanded from having dogs in one yard to two different yards, as well as 15 prisoners participating to now having 35 help train our dogs. 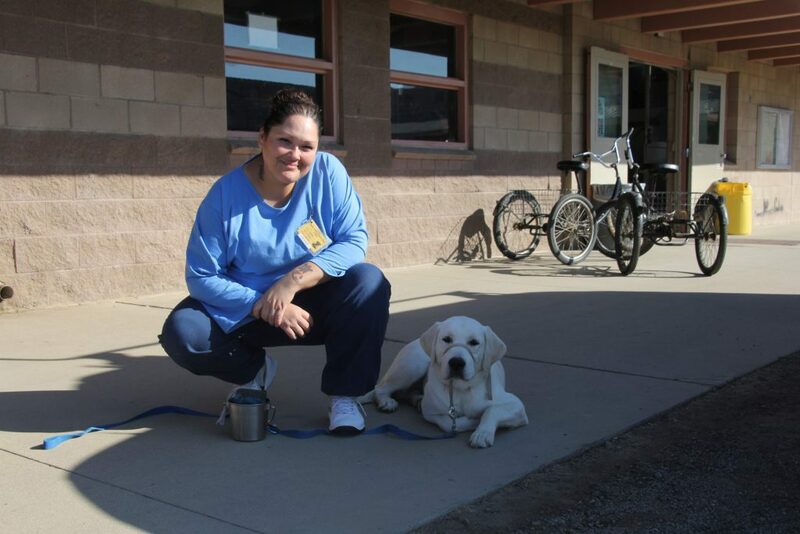 Regardless of the challenges and issues that have arisen, both the inmates and staff have been more than helpful in assisting Dana start the base to a program that should be sustainable for years to come. 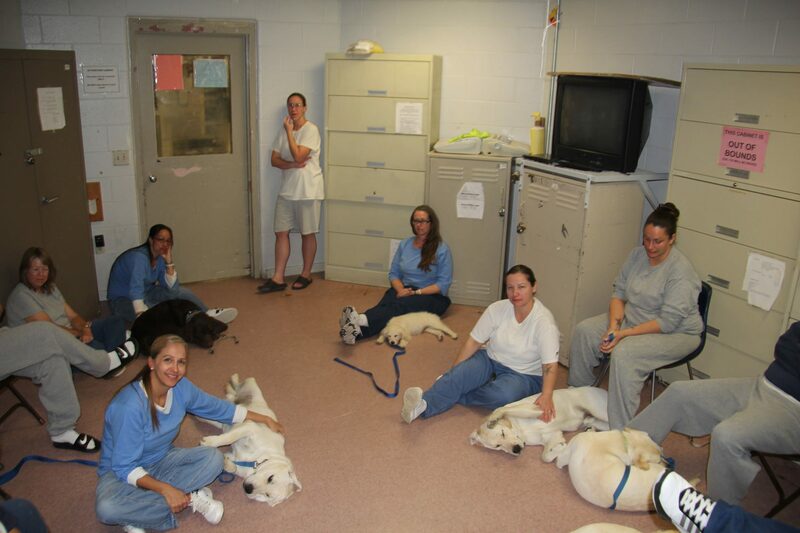 Our first group of dogs that were dropped off in August are due to return in the first few months of the new year. 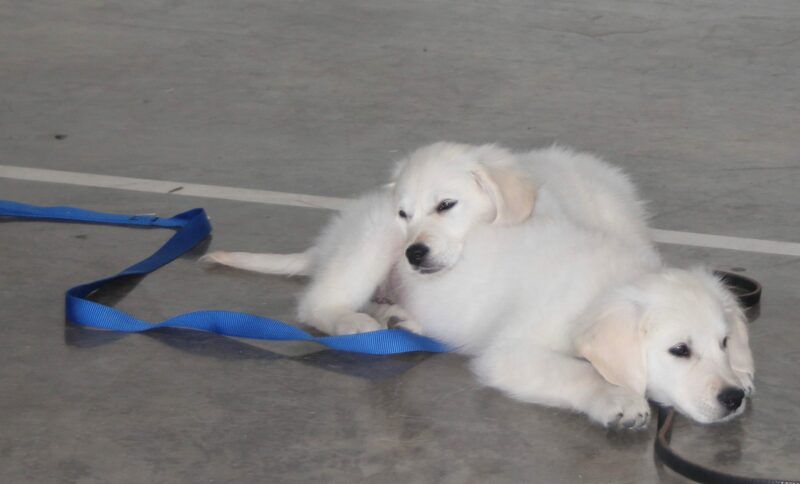 We are anxious to see how they have grown! 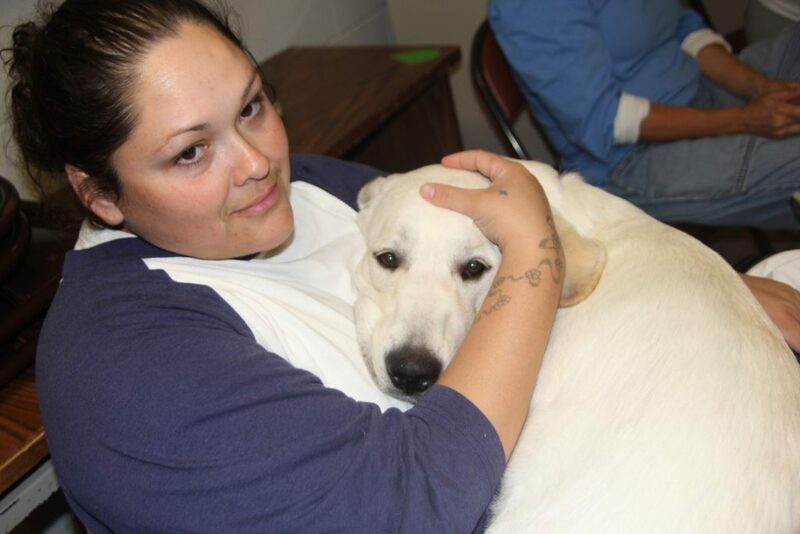 Everyone at CCWF has been incredibly generous in helping with the growth of this program. 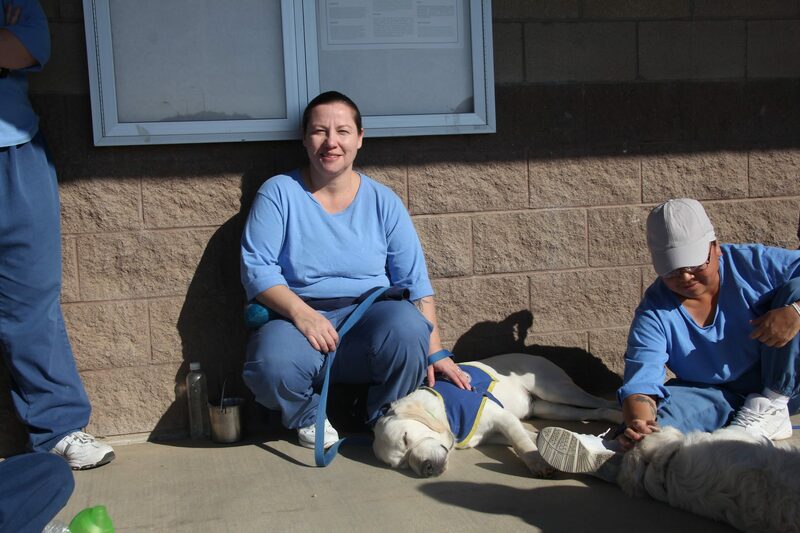 Not only has staff purchased fans and dog beds, but the trainers have created vests and made books for the dogs’ eventual recipients. 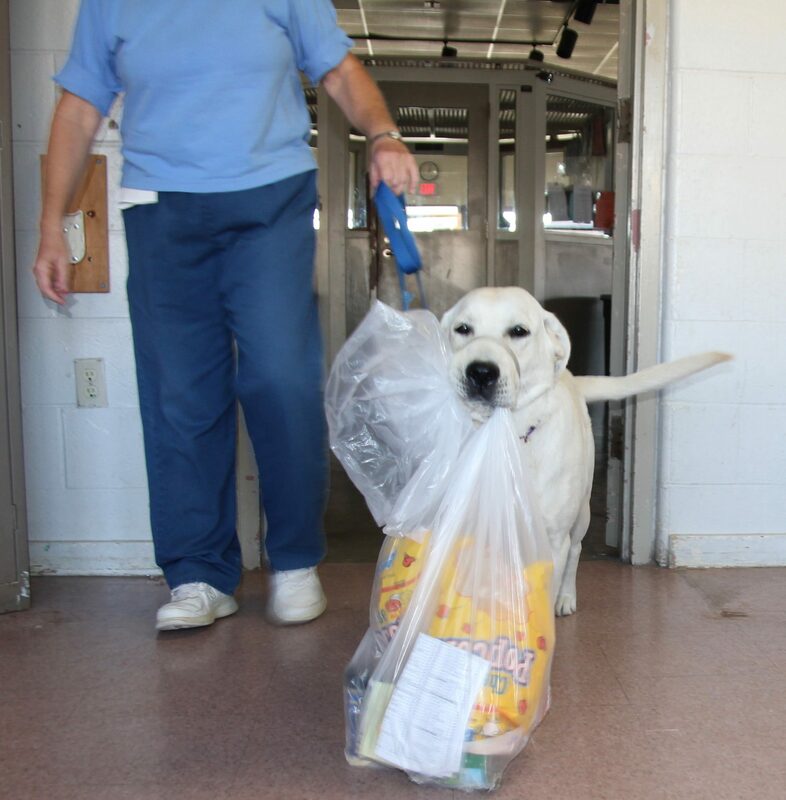 The facility has even put out donation boxes for the dogs which are continually being filled with toys and treats! 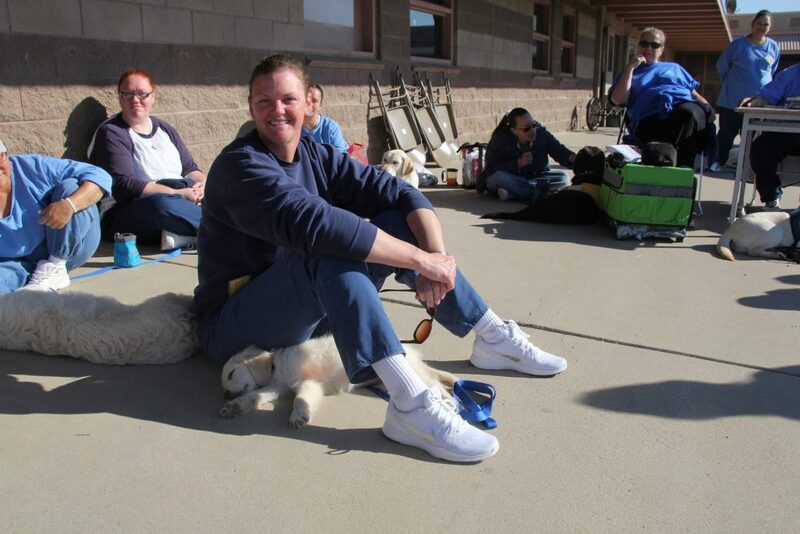 We are truly lucky to have met a group of people that care so deeply for our dogs. 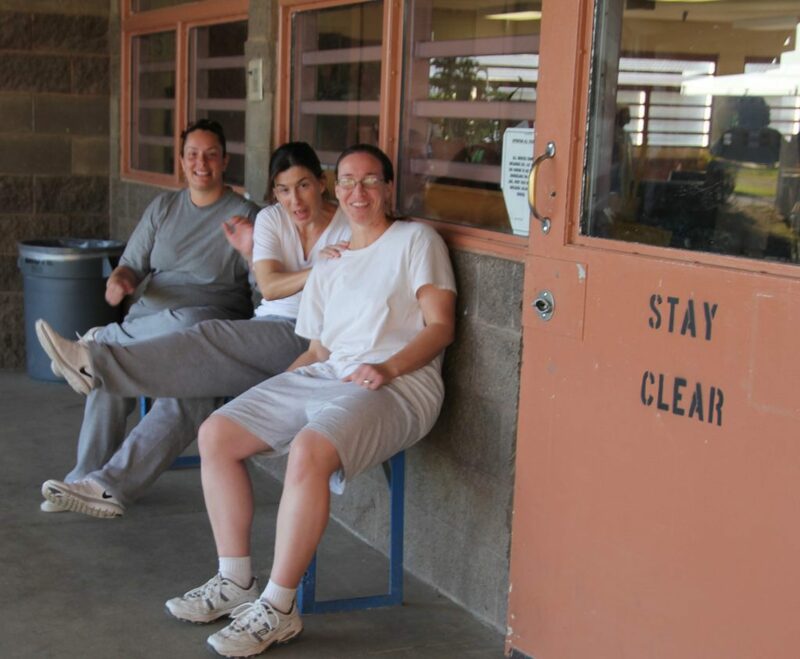 After talking with Dana she says throughout her trip she was constantly stopped by both staff and inmates to be told how grateful they were for the program. 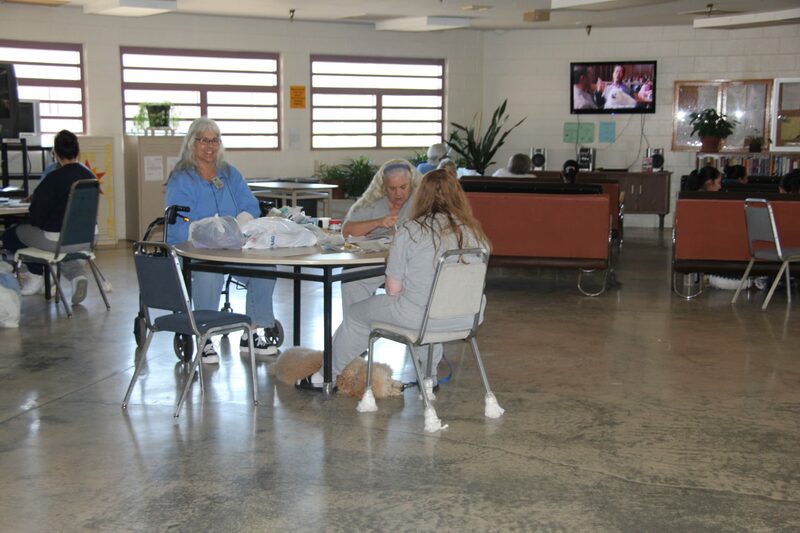 Says Dana, “The most remarkable statement in my opinion has been ‘Thank you for starting this program and adding peach and warmth to a place doesn’t have much.’ I see a bond being created by inmates that now have a common bond. 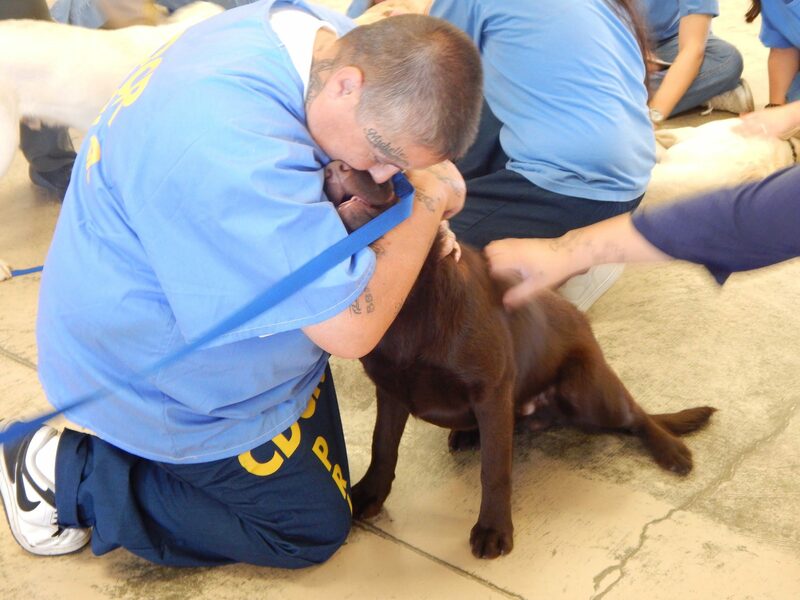 There’s also a partnership being created between staff and inmates as they have to interact. 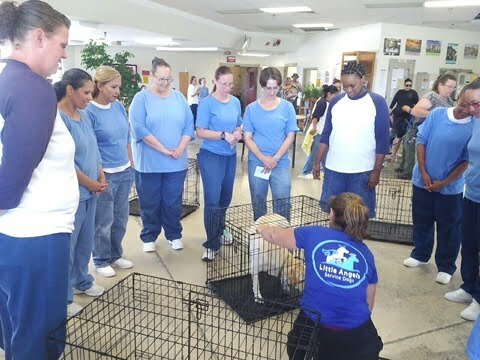 This program has a way of changing your outlook on people and being open minded. The inmates are people with stories and hope for their future.” Dana reports that every inmate during their first interview has said they want to do something positive to help someone else. 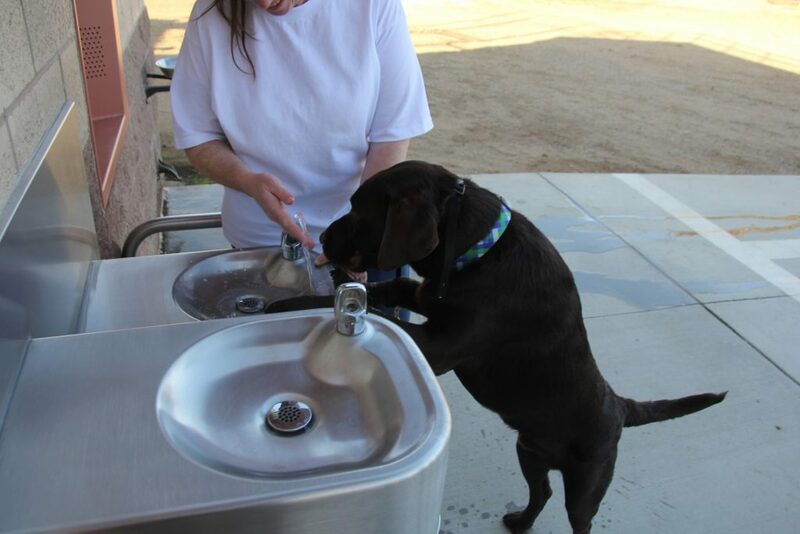 Some mentioned that it was a way to right their wrongs. 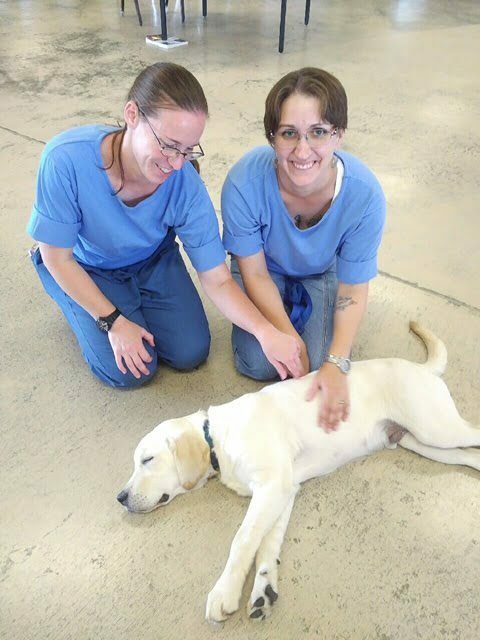 They told Dana that this program gives them the chance to wake up with a positive sense of purpose. 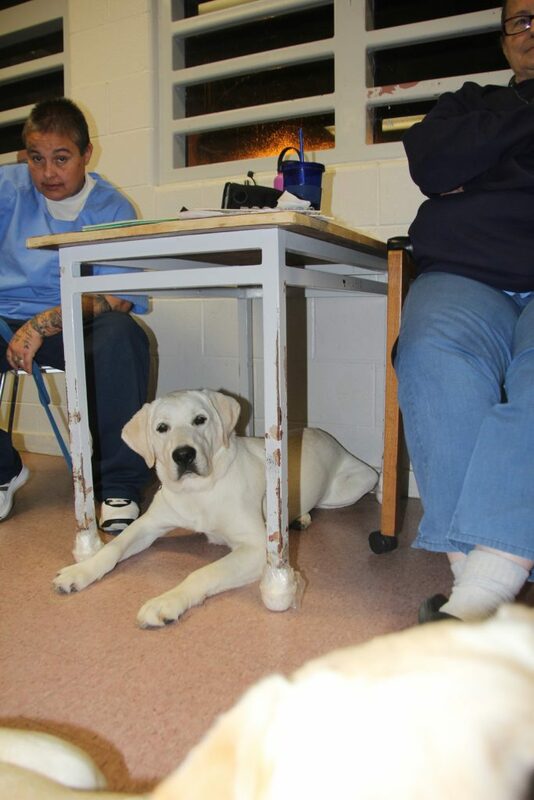 This holiday season we give thanks for the peace our dogs have added to this facility, and most of all thanks to the staff and trainers for keeping our dogs safe and preparing them for their future. 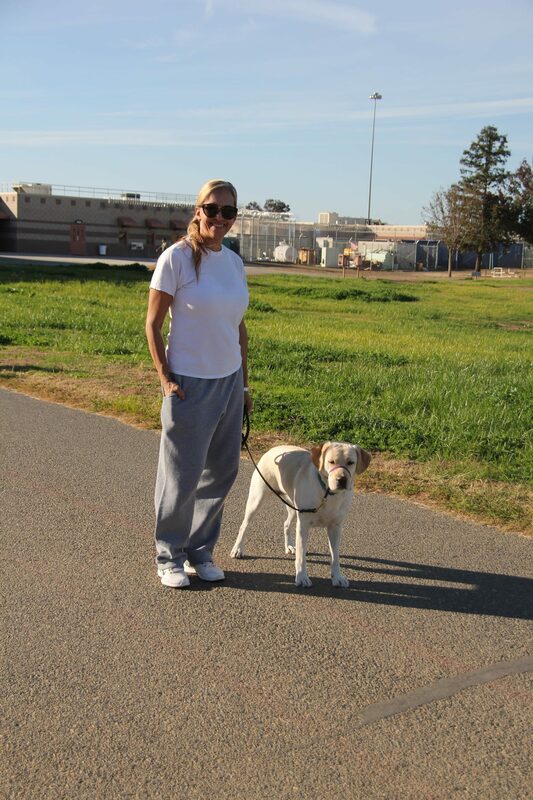 Thank you to Dana for all the work and long hours traveling to check in on the facility. 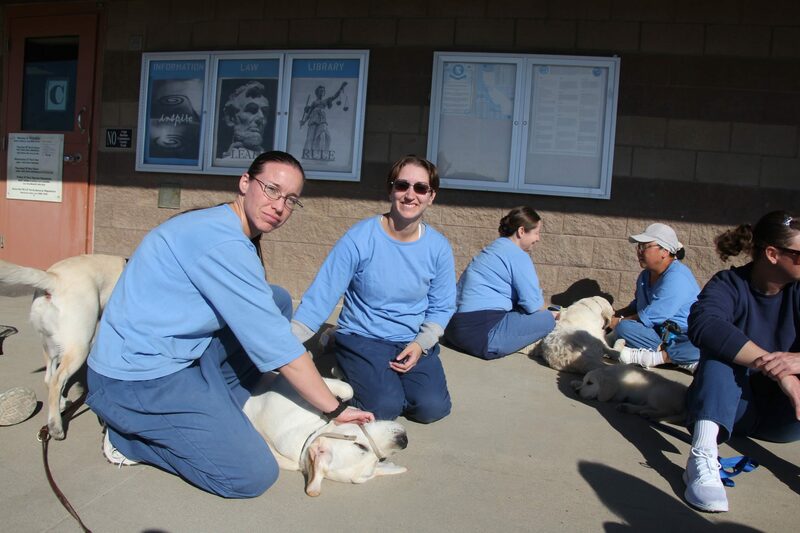 We are so happy with where this program is going, and it’s giving us the chance to train more dogs than ever before. 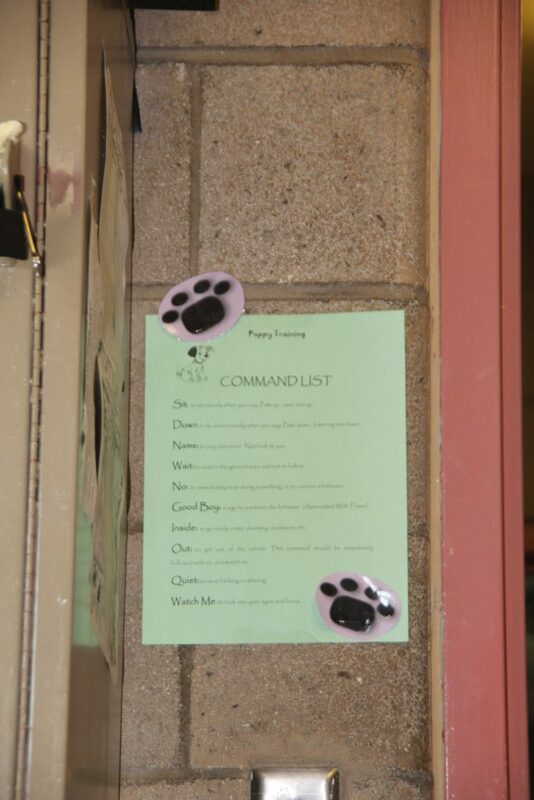 We will have more updates coming soon! 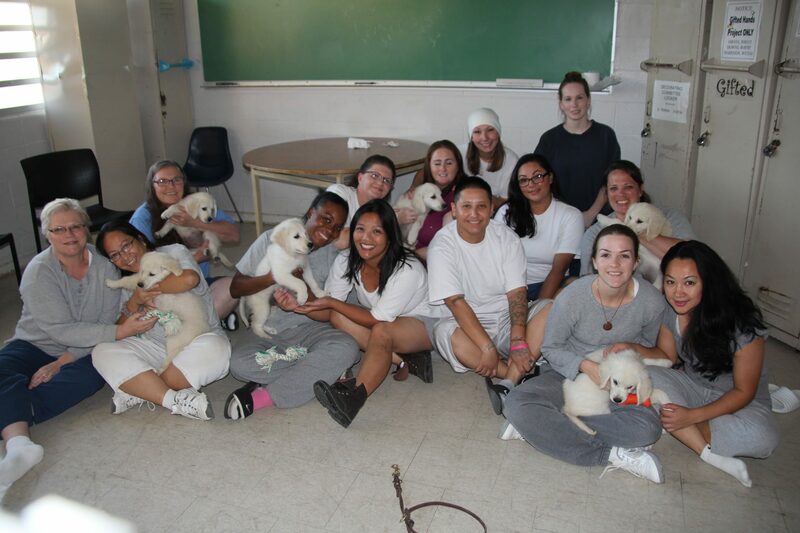 After a year of hard work we are excited to announce we have finally launched our Little Angels Prison Program. 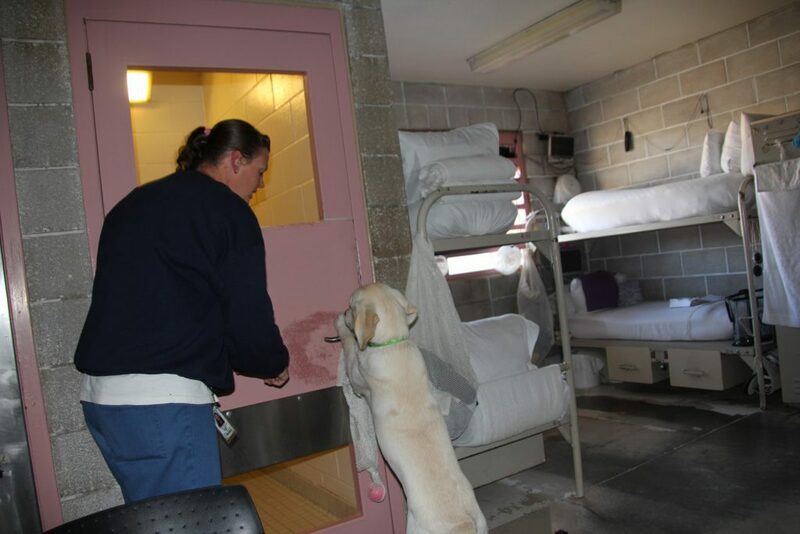 We have partnered with two prisons thus far and hope to bring more on board in the coming future. Our prison program manager, Dana, set out to the Central California Women’s Facility in Chowchilla, CA with six of our puppies. 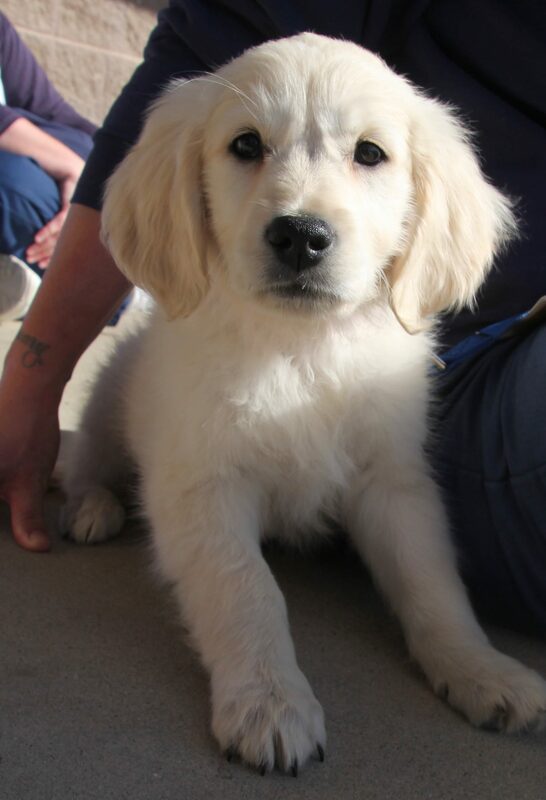 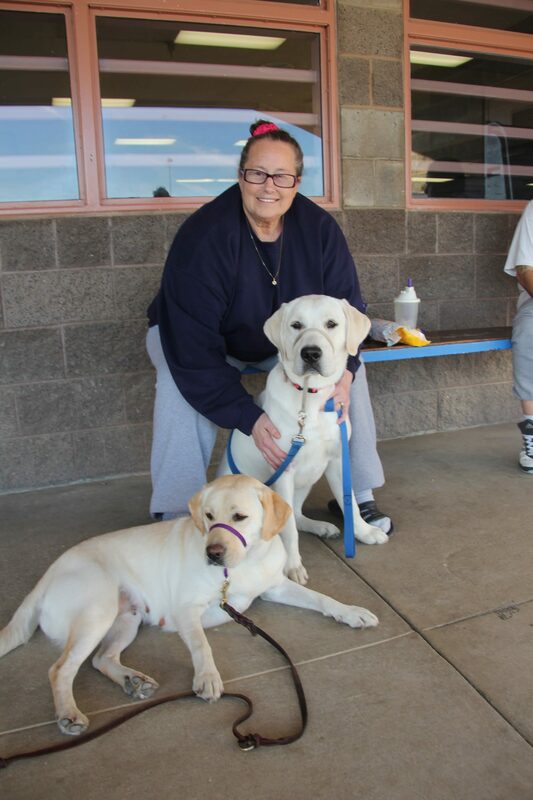 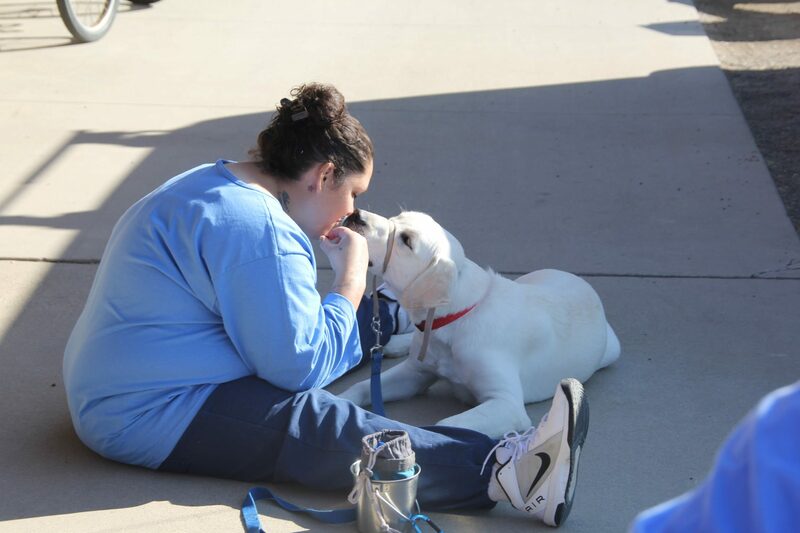 Her goal was to meet with both the inmates and staff in order to properly train them on raising puppies to become service dogs. 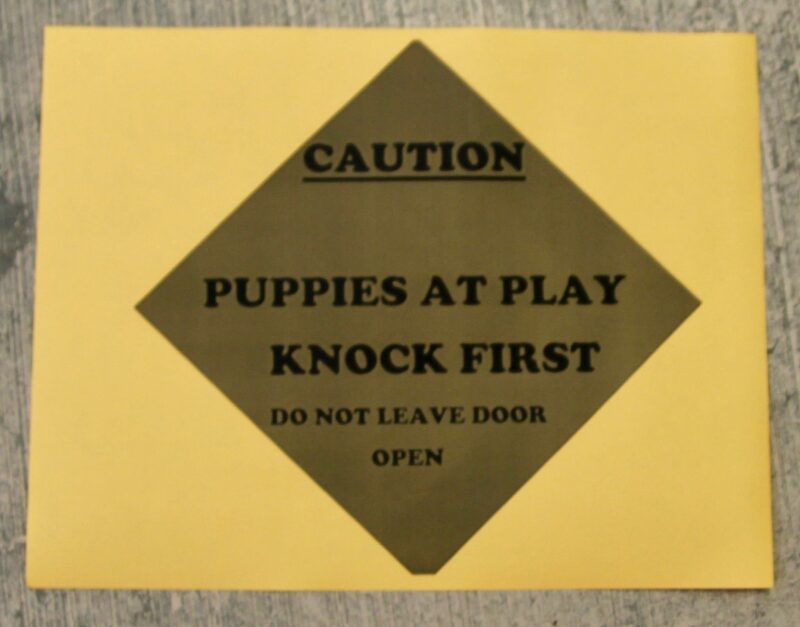 Immediately upon arriving the puppies were a huge hit. Dana worked for several days teaching the basics on training and how to problem solve. 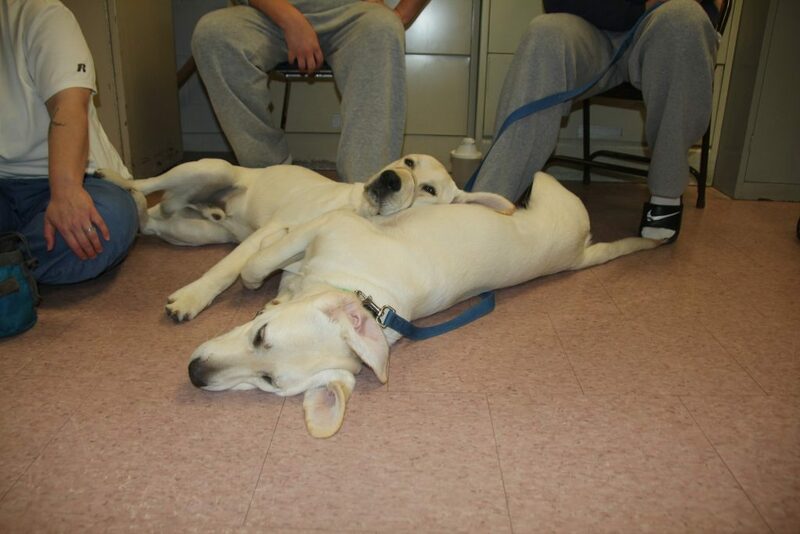 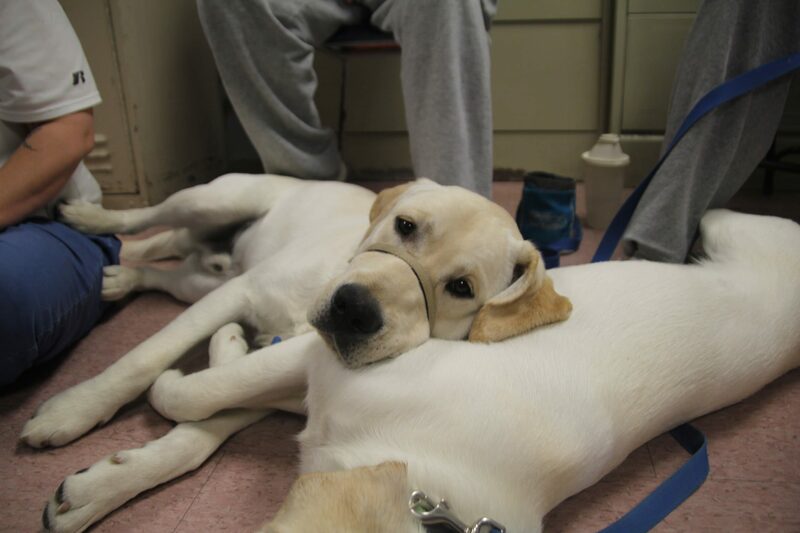 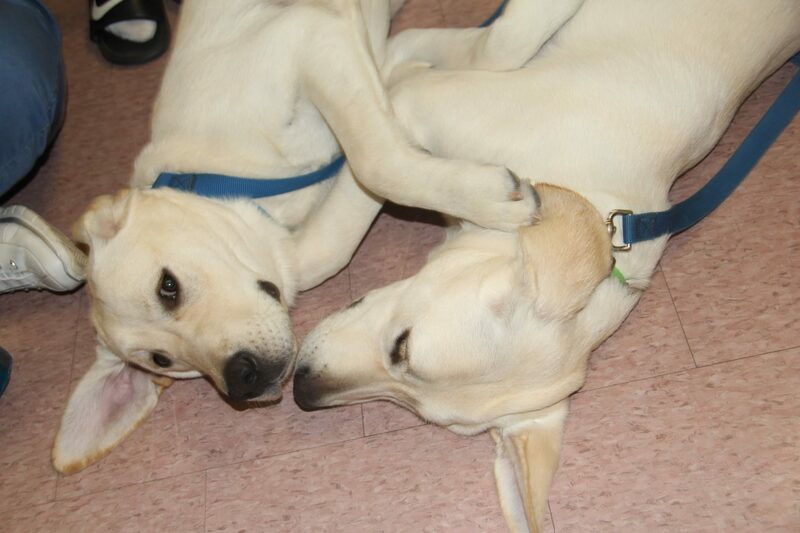 Each puppy was paired up with a team of two trainers at the facility. 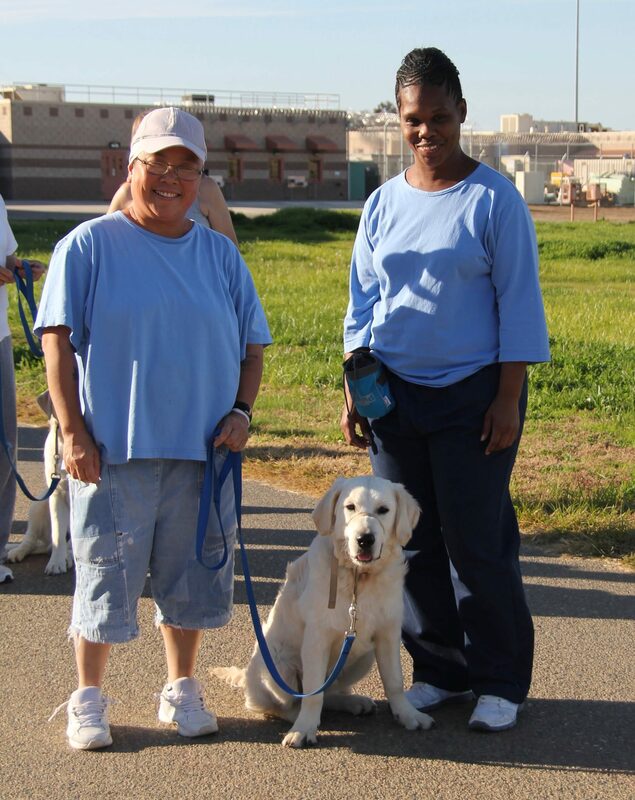 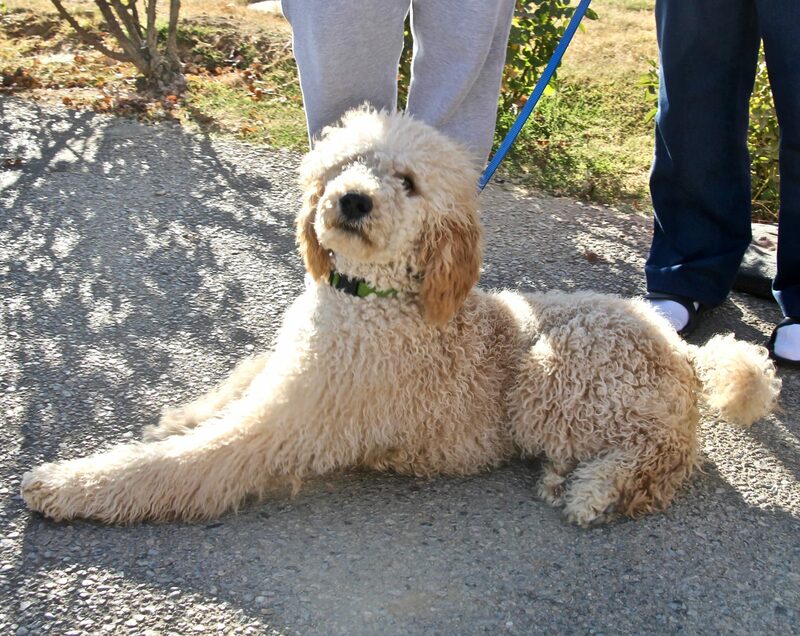 The trainers will take turns working with the dog and helping them to reach their goals. 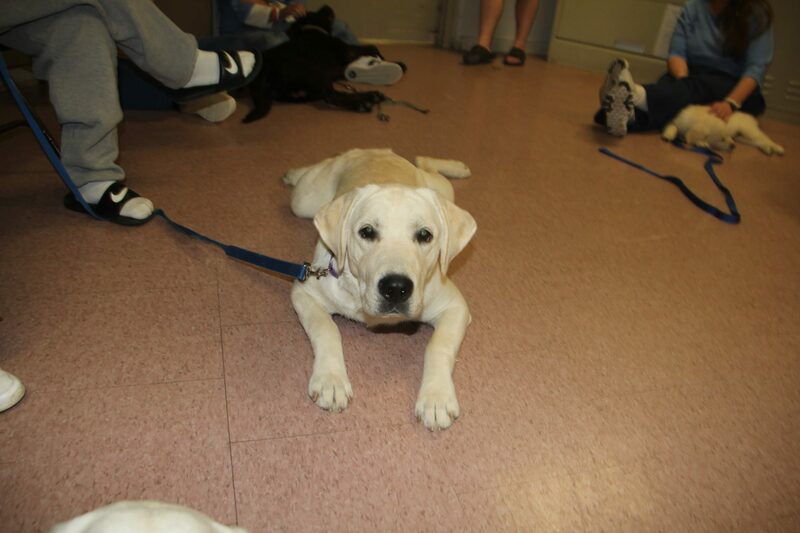 The program is going incredibly well and there is nothing but positive energy and determination. 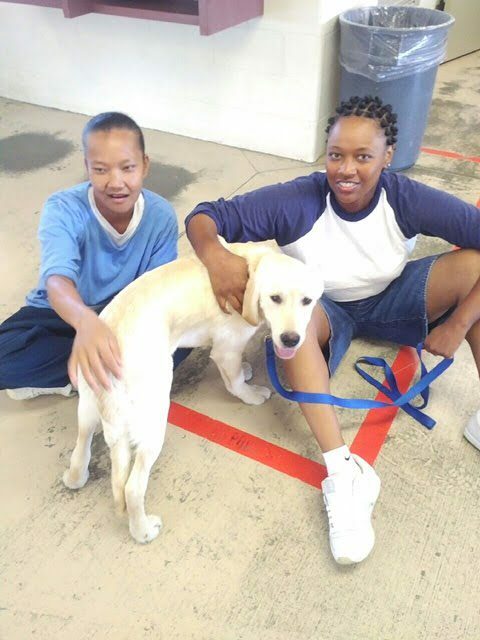 Each inmate is extremely grateful for the opportunity and seemed so happy to work with the dogs – and our dogs really enjoy all the attention! 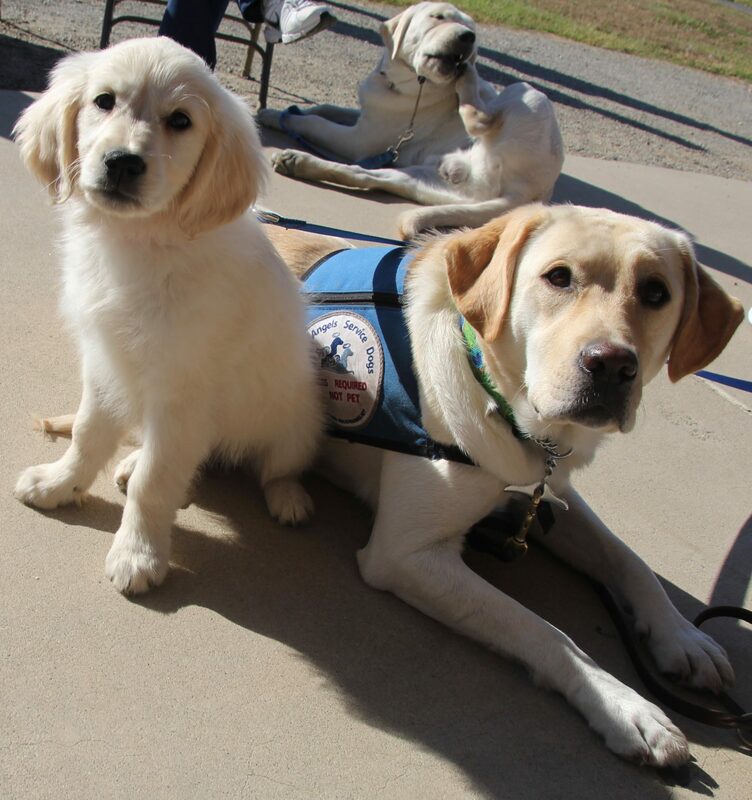 puppies are growing and maturing, the most important factor in them becoming service dogs is positive interactions and experiences with humans and the outside world. 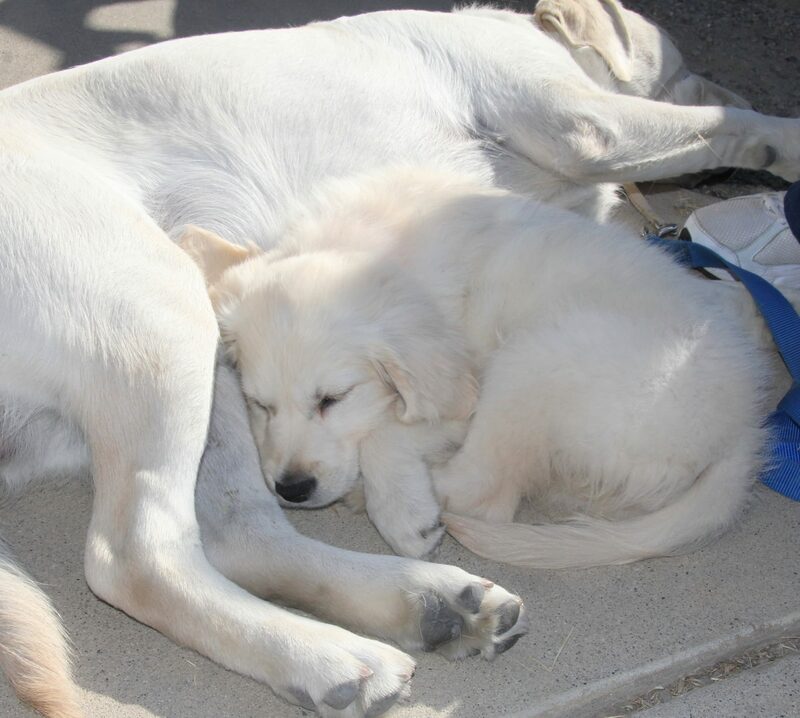 For this reason, there is nothing better than us being able to give our puppies to a program like this, where each foster will have an abundance of time each day to work with the dogs. 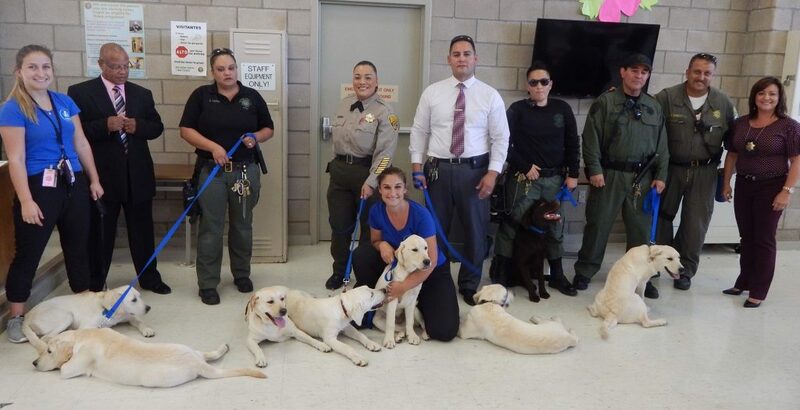 With the dogs having multiple different people training them at the facility, they will get used to working with different personalities and will be able to handle new transitions much better. 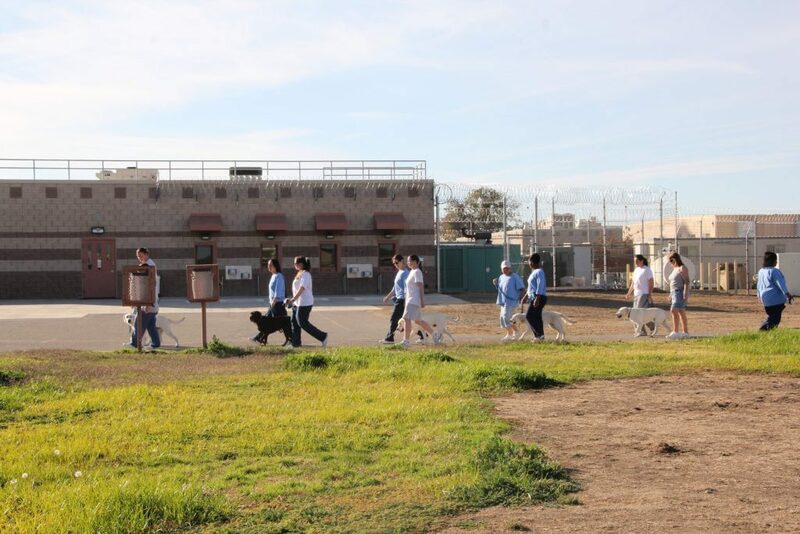 At the same time, we are hoping to help each and every one of these inmates. 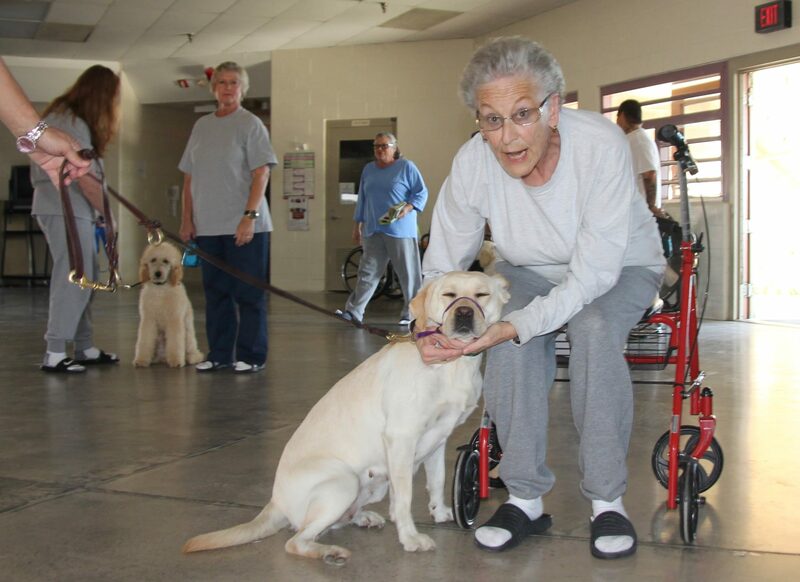 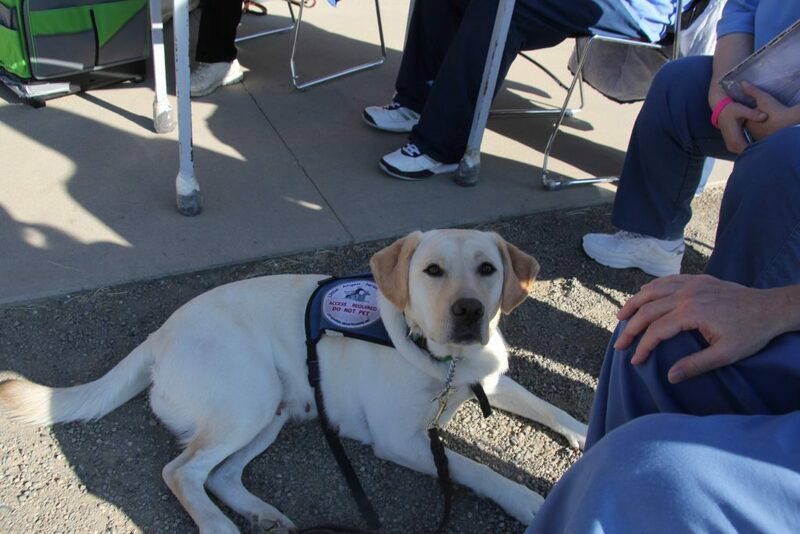 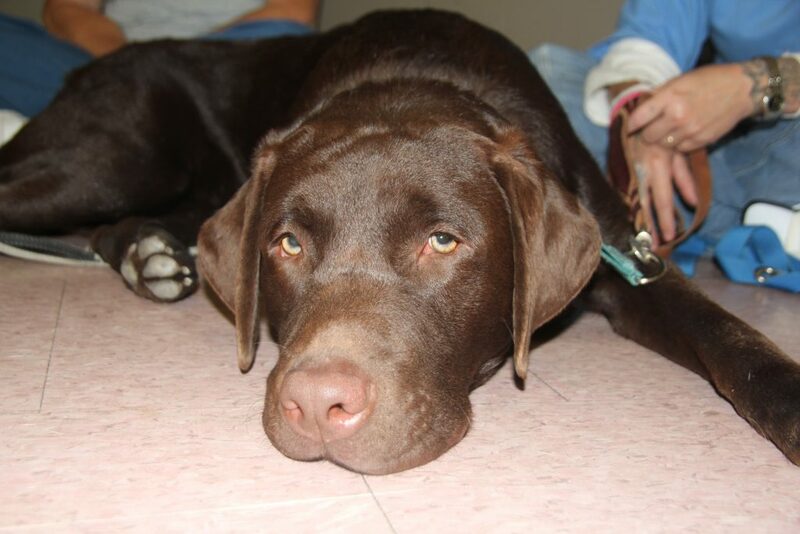 There is no job more rewarding than training a dog to help someone with a disability. 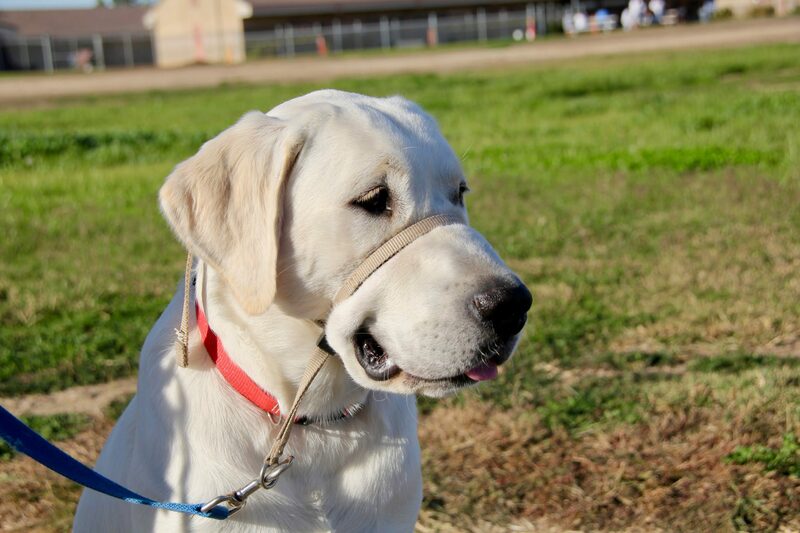 Seeing the dog grow and become smarter every day is one of the most satisfying feelings. 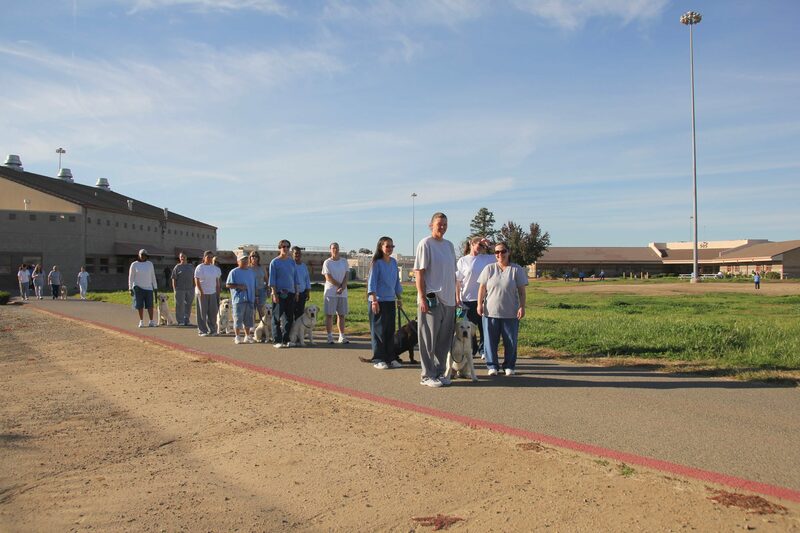 We believe this program will help to give these inmates a sense of purpose and responsibility, while also improving their overall happiness. 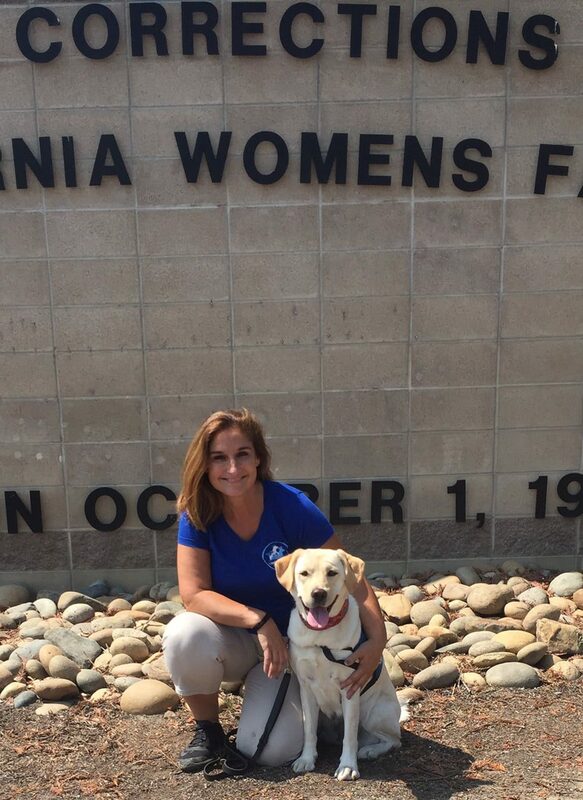 Dana is in constant contact with the Central California Women’s Facility to ensure everything is running smoothly. 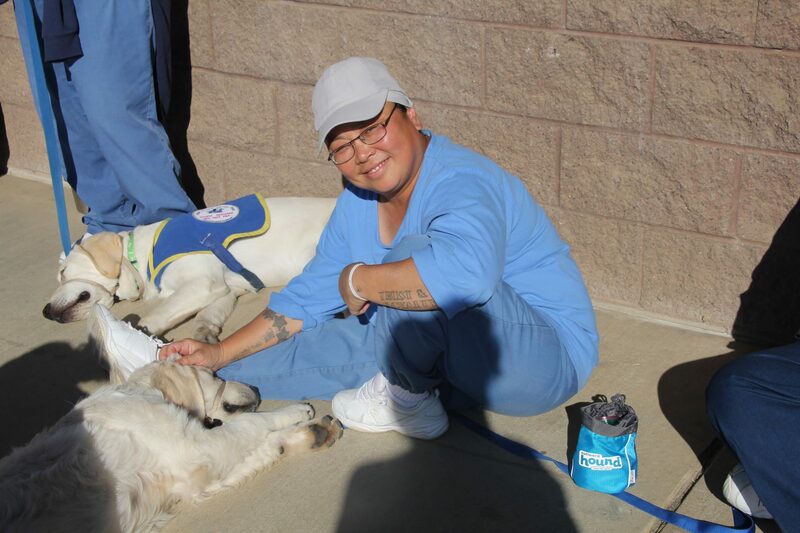 She will get continuous updates on our dogs and be ready to help out should a problem arise. 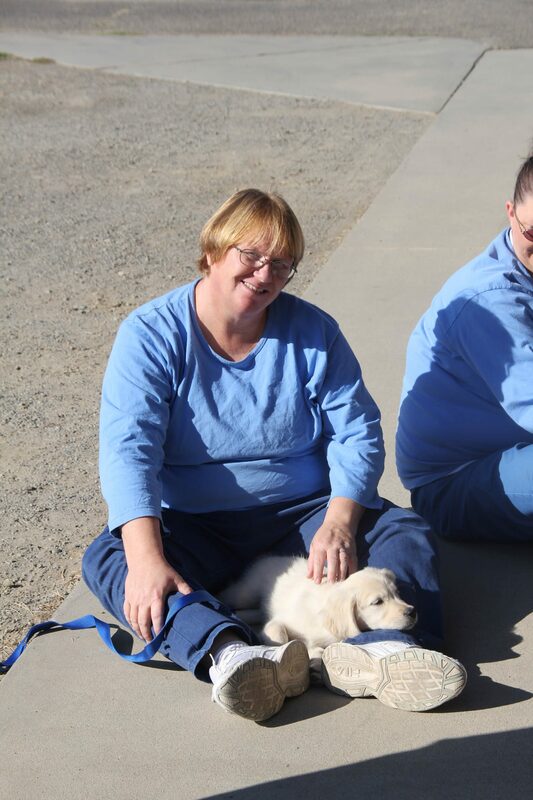 Our goal is to have puppies rotating in and out of the prison facility so they get ample time with the inmates while also getting occasional check-ups by our trainers at the ranch. 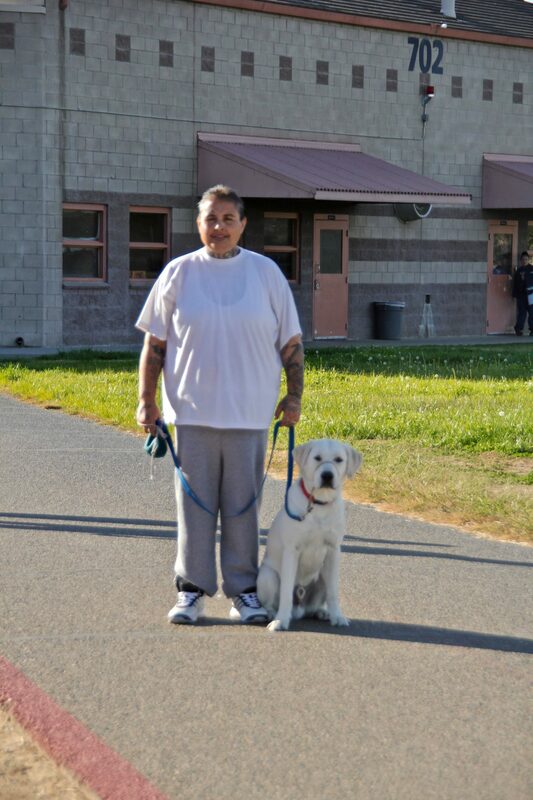 In the next month, Dana will be making another trip to take more puppies to the Avenal State Prison in Avenal, CA, which is an all male facility. 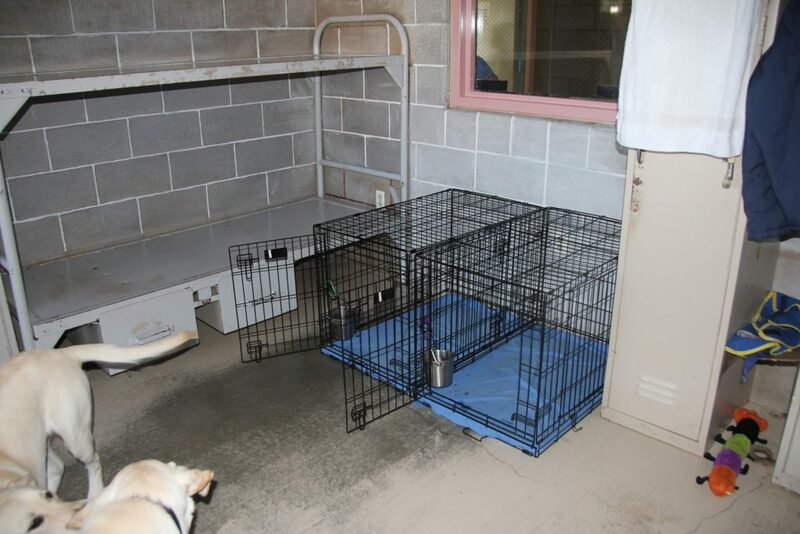 We plan to move our dogs between the two different facilities so that they are raised with both men and women. 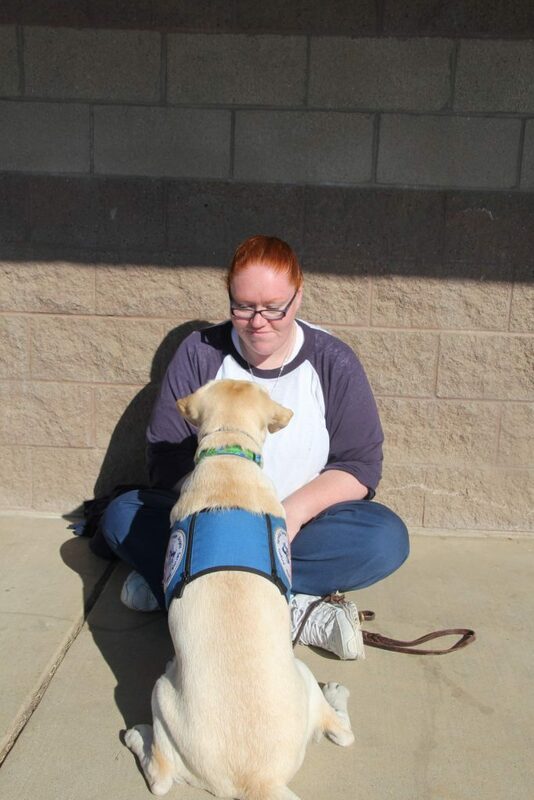 We are very excited and optimistic about the progress of this program. 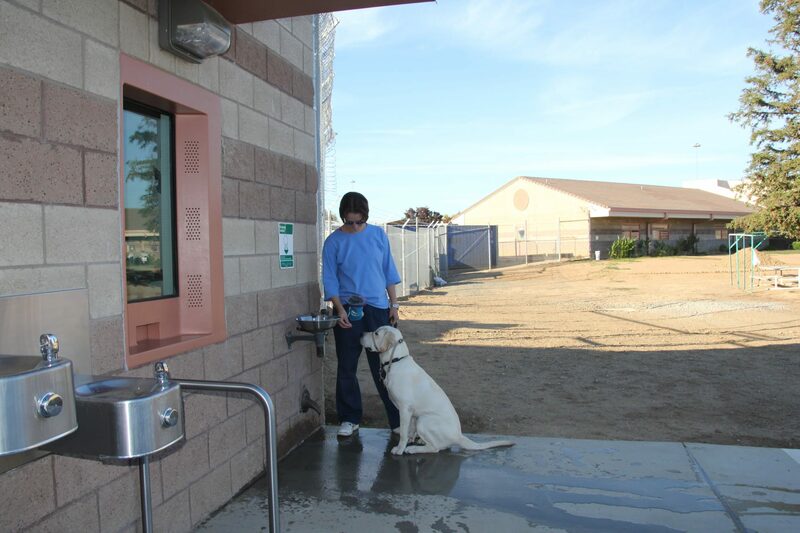 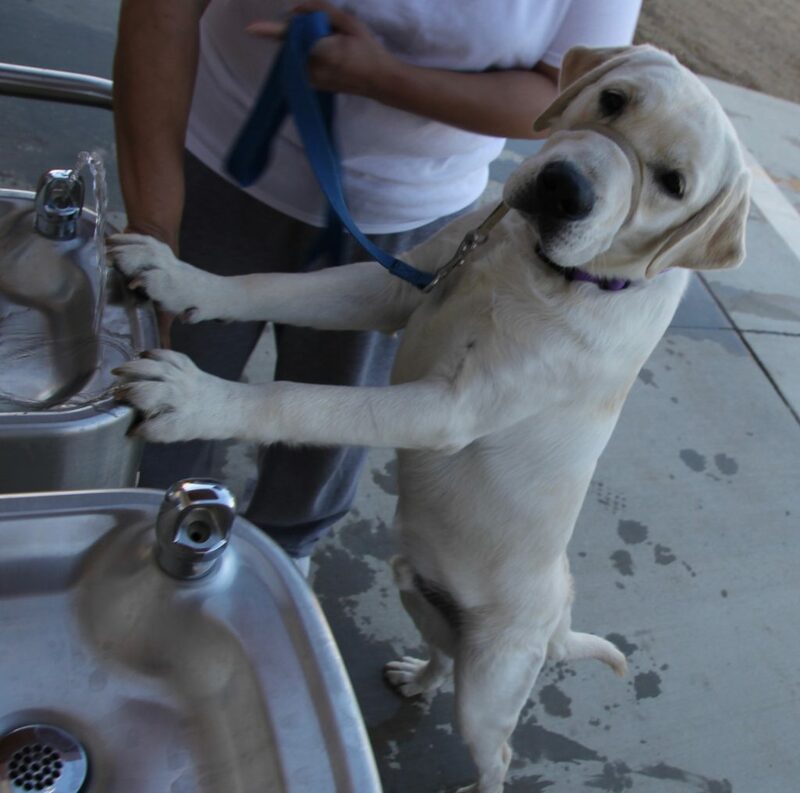 We believe this will be truly beneficial to helping us place more service dogs and get them trained at a faster rate. We plan to continually update this page and let everyone know how the program is doing, both with pictures and stories. 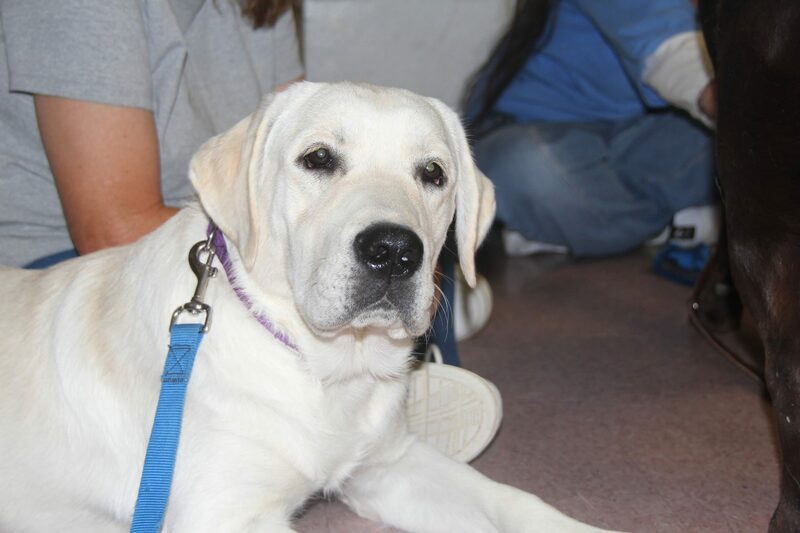 If you are interested in donating to help us keep this program running, please see the link below. 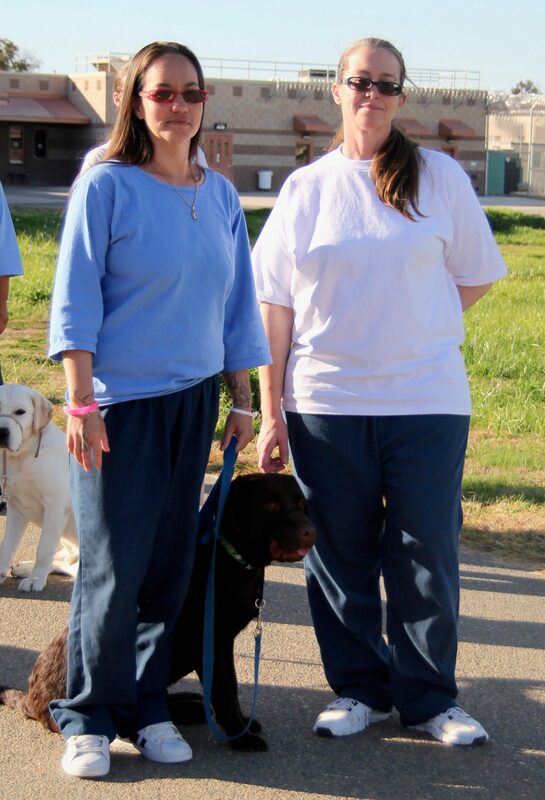 100% of the funds go towards making sure these puppies are successful in working with their inmates. 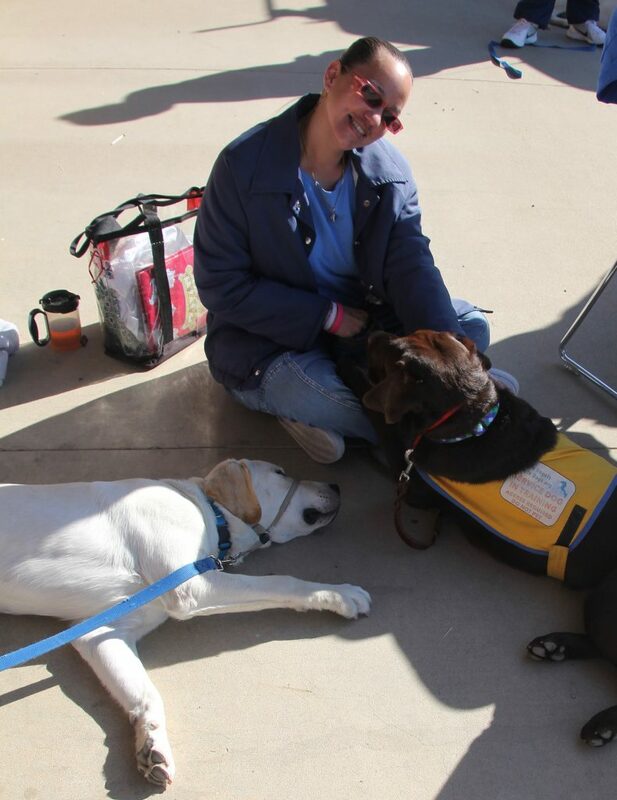 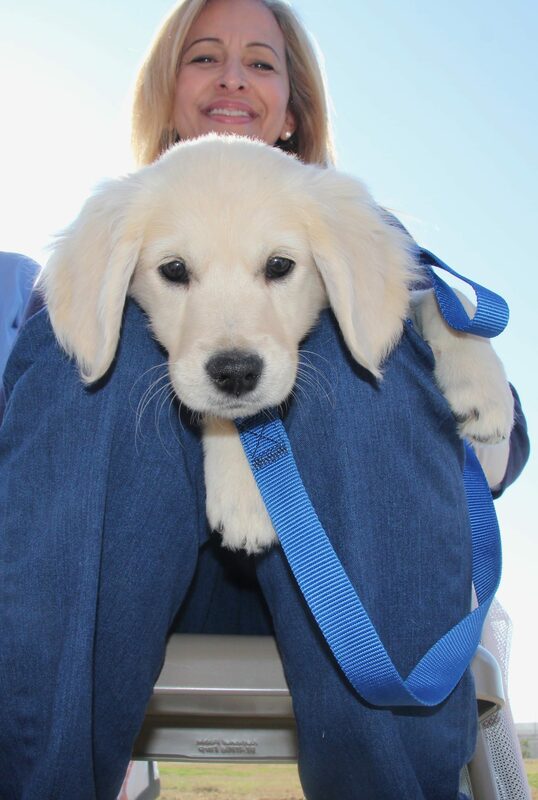 As always, thank you for the ever continuing support of Little Angels Service Dogs. 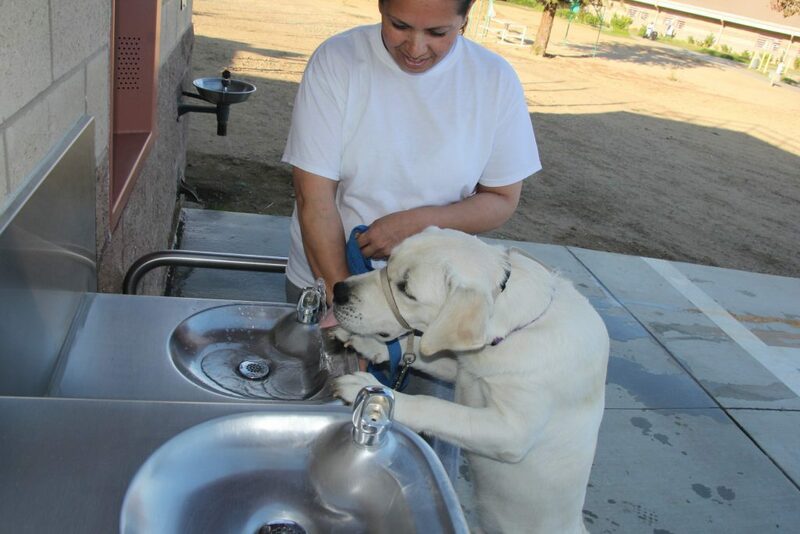 We could never do it without you!